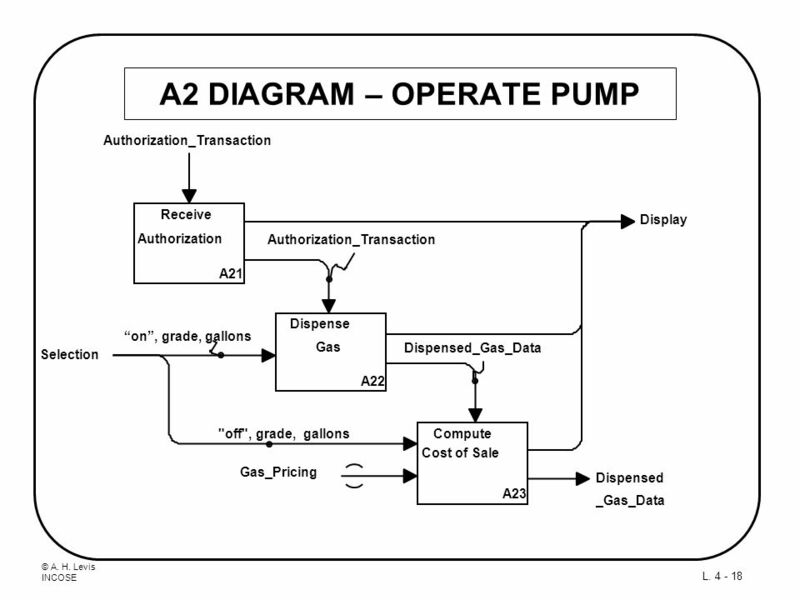 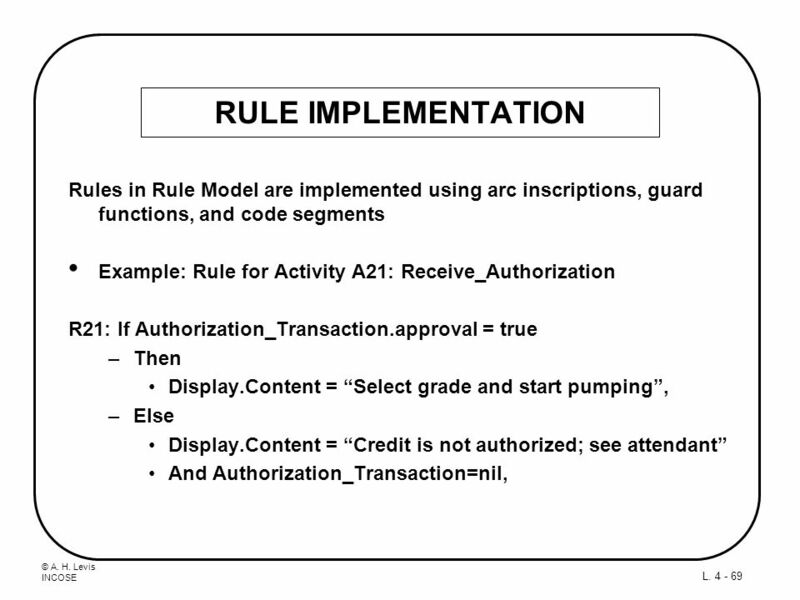 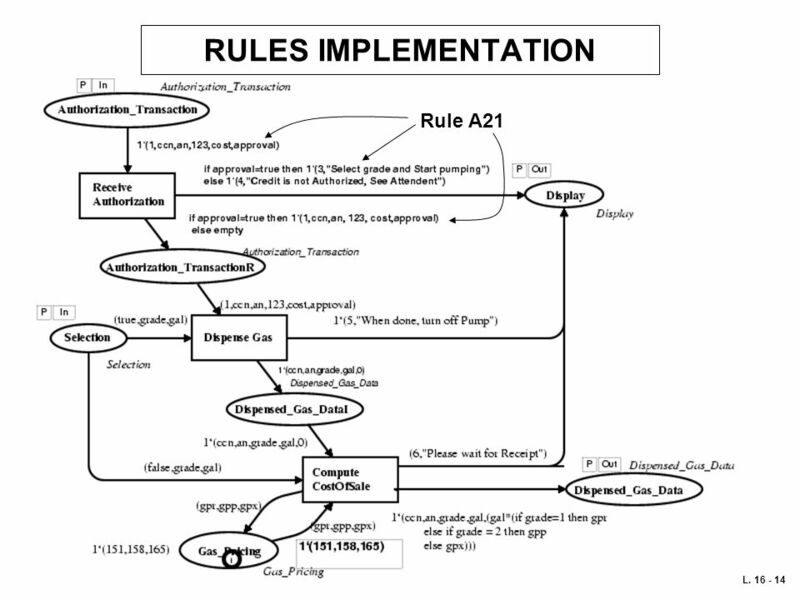 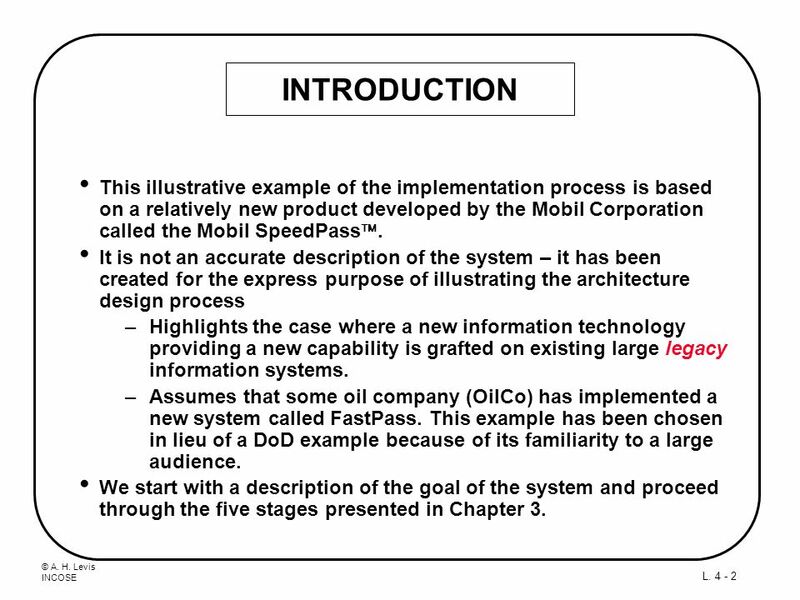 2 INTRODUCTION This illustrative example of the implementation process is based on a relatively new product developed by the Mobil Corporation called the Mobil SpeedPass. 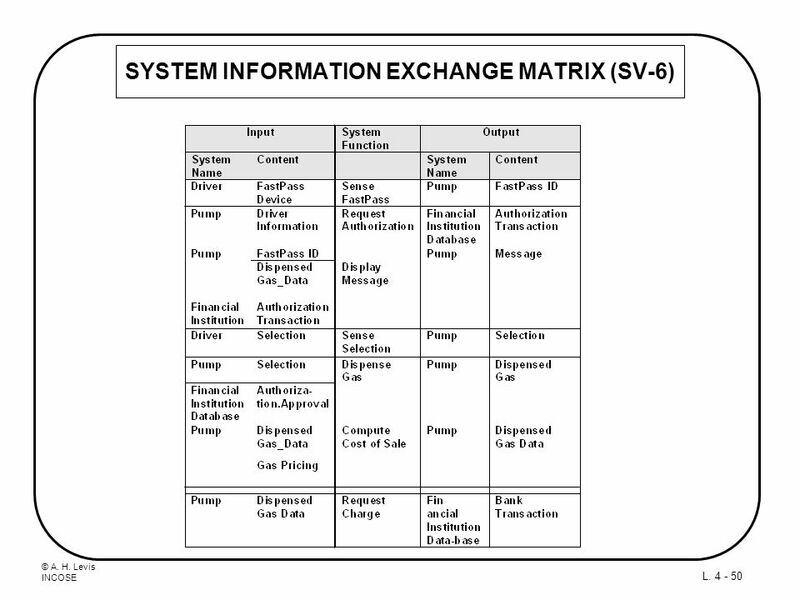 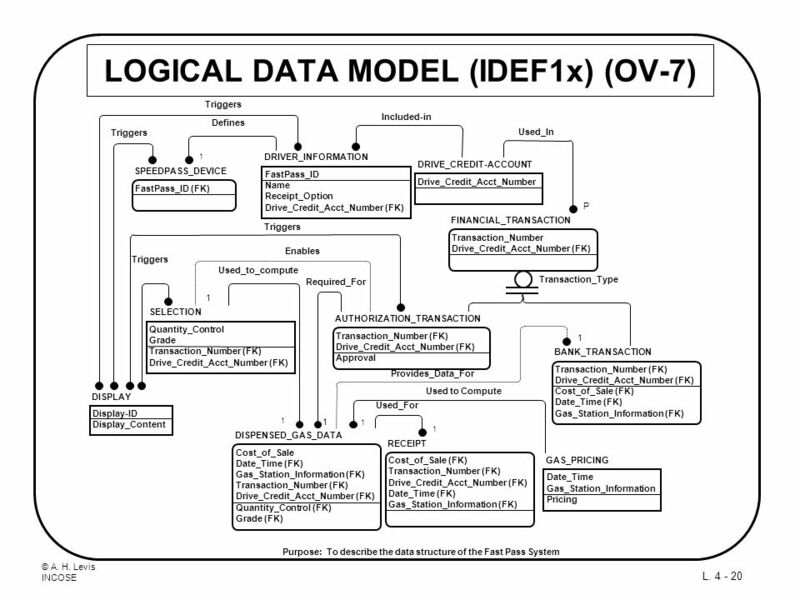 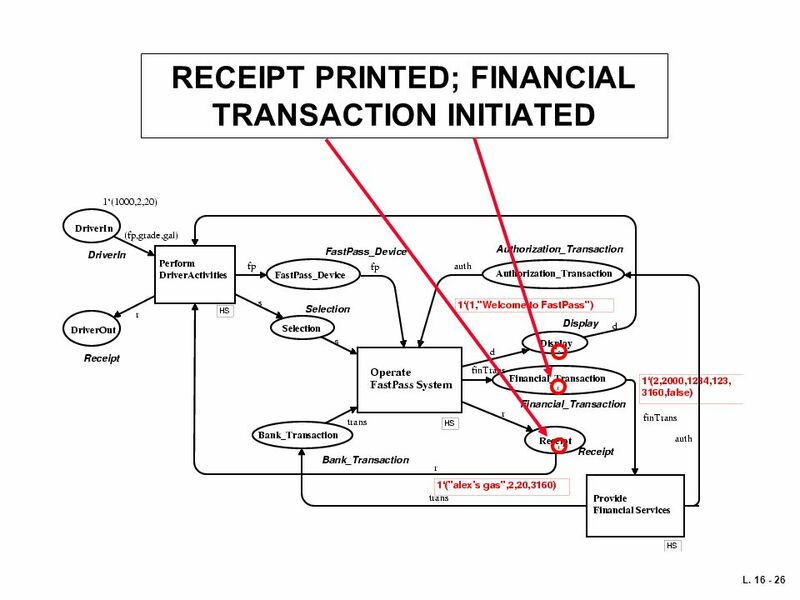 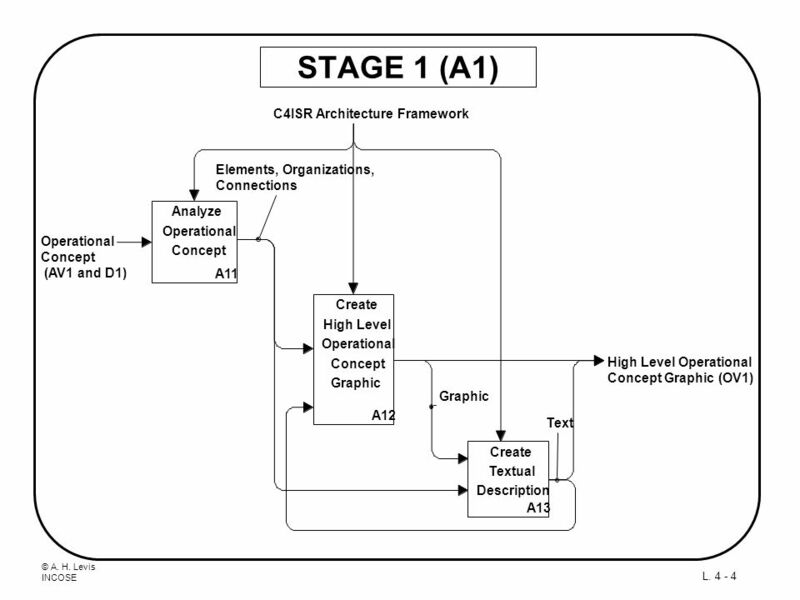 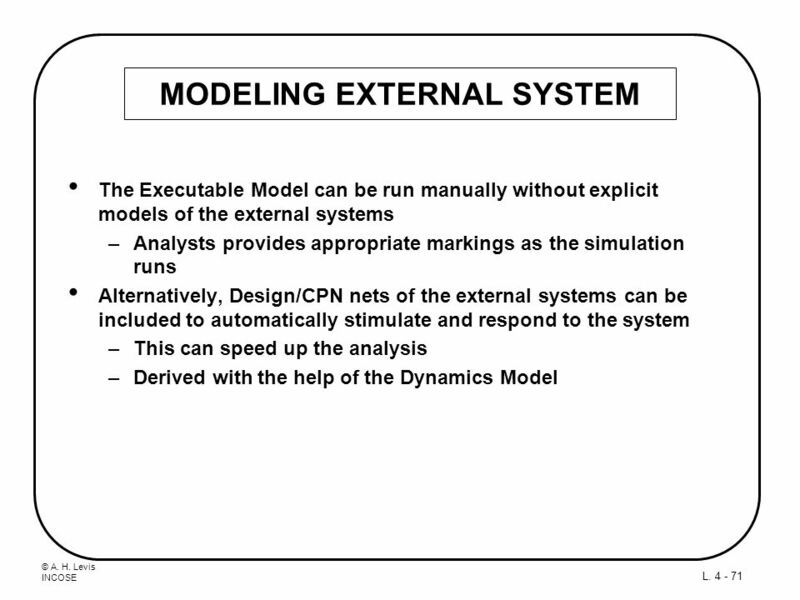 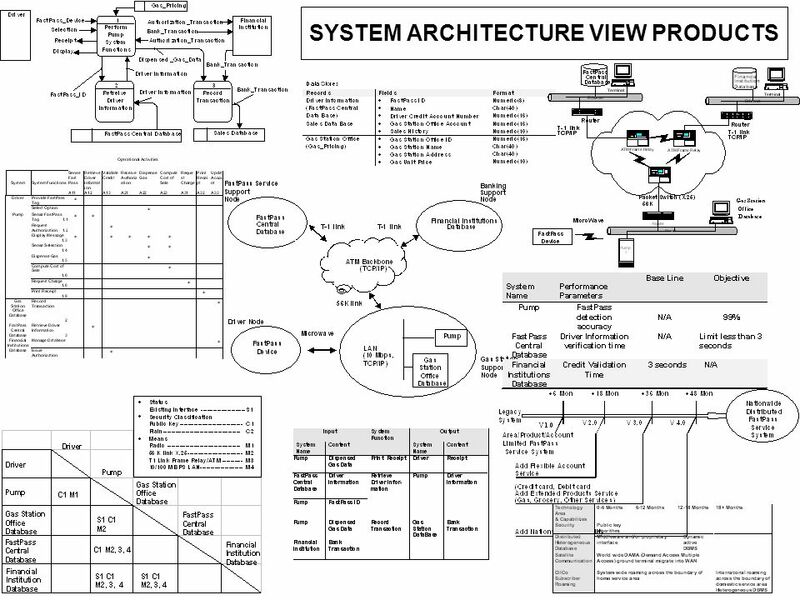 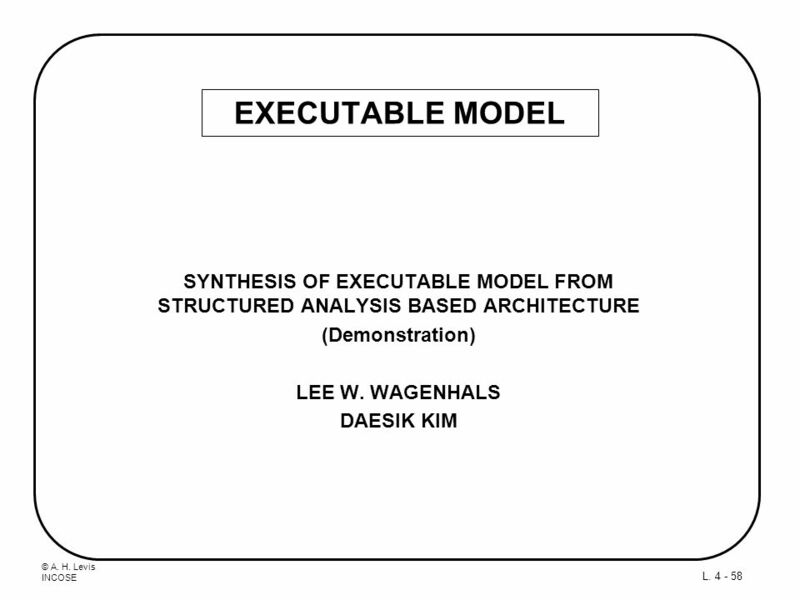 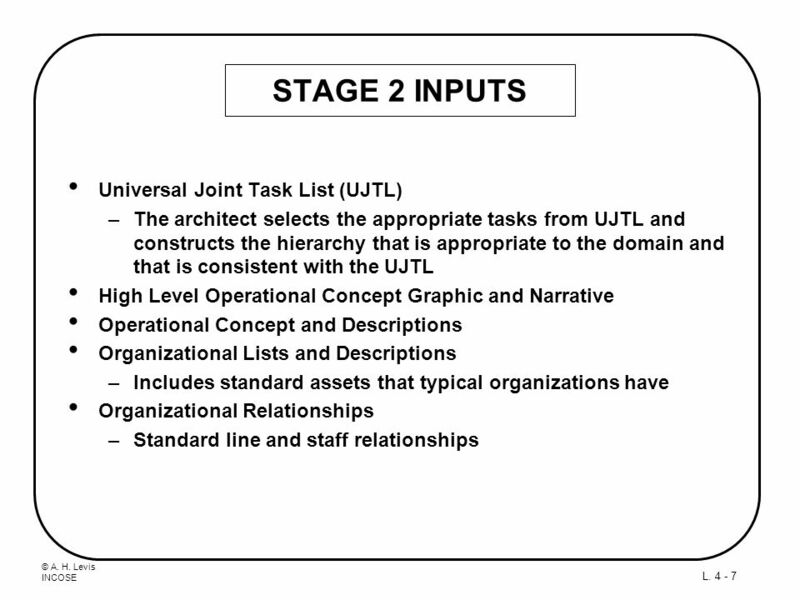 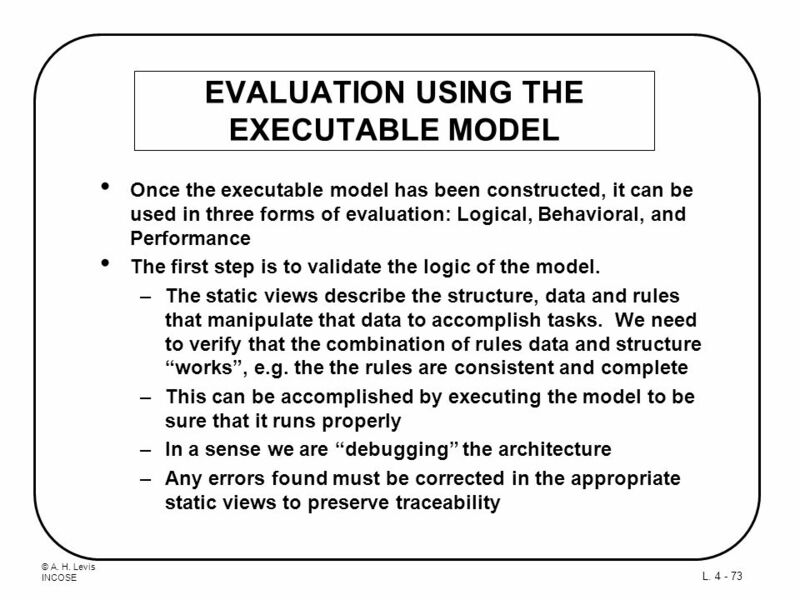 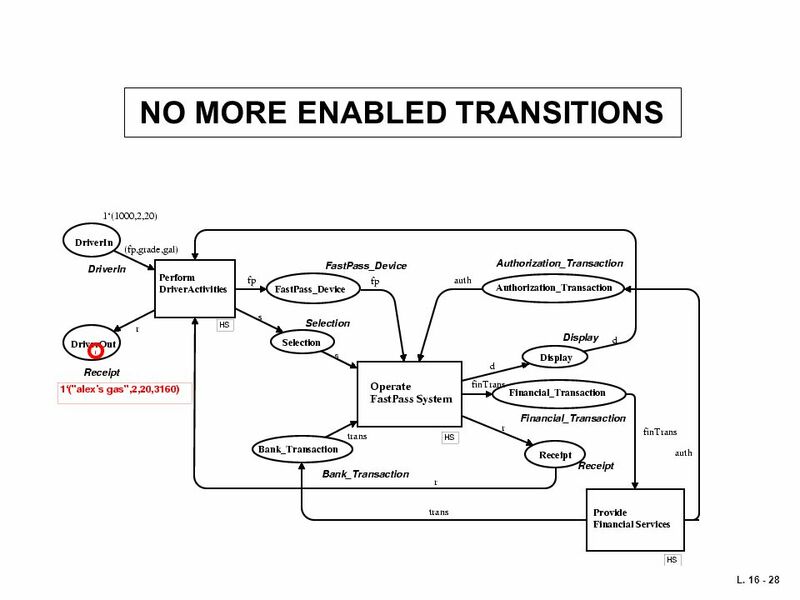 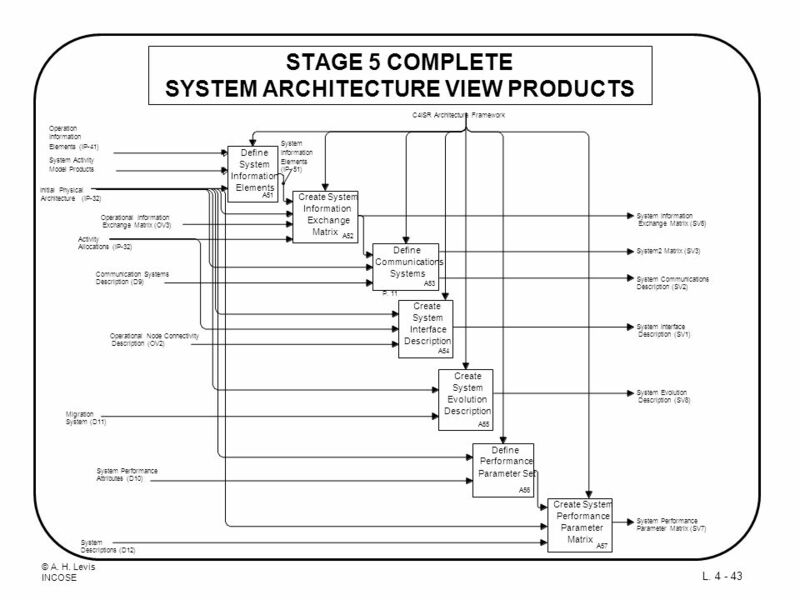 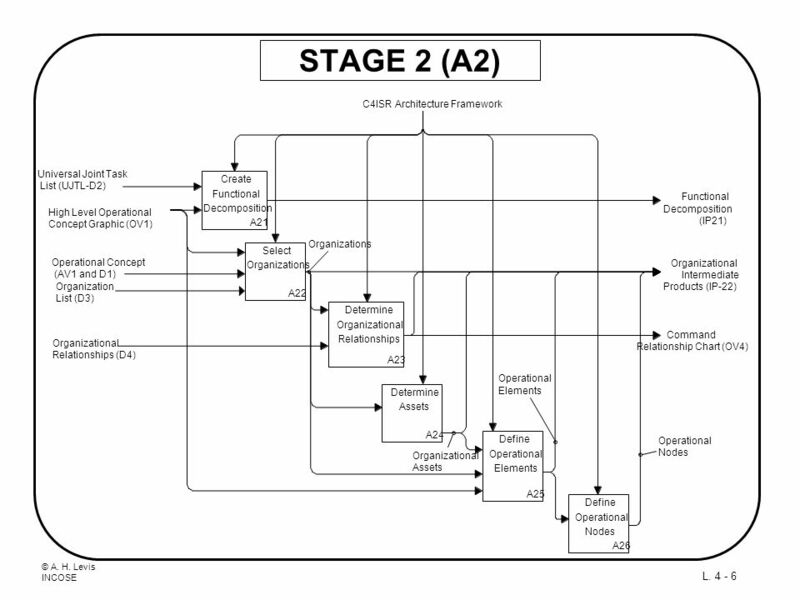 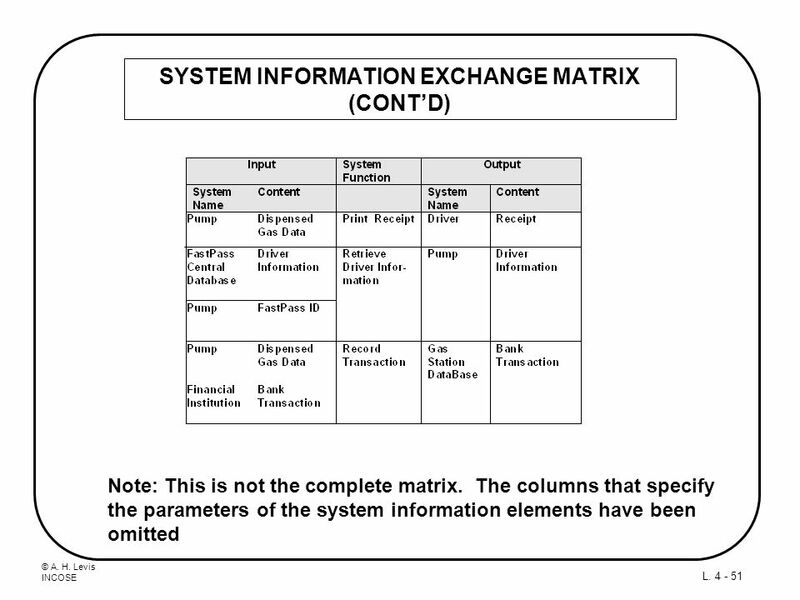 It is not an accurate description of the system – it has been created for the express purpose of illustrating the architecture design process Highlights the case where a new information technology providing a new capability is grafted on existing large legacy information systems. 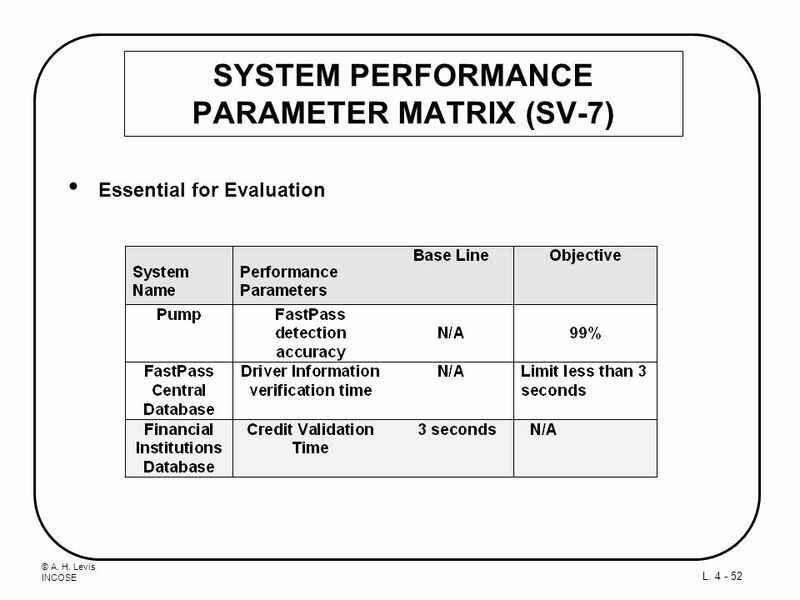 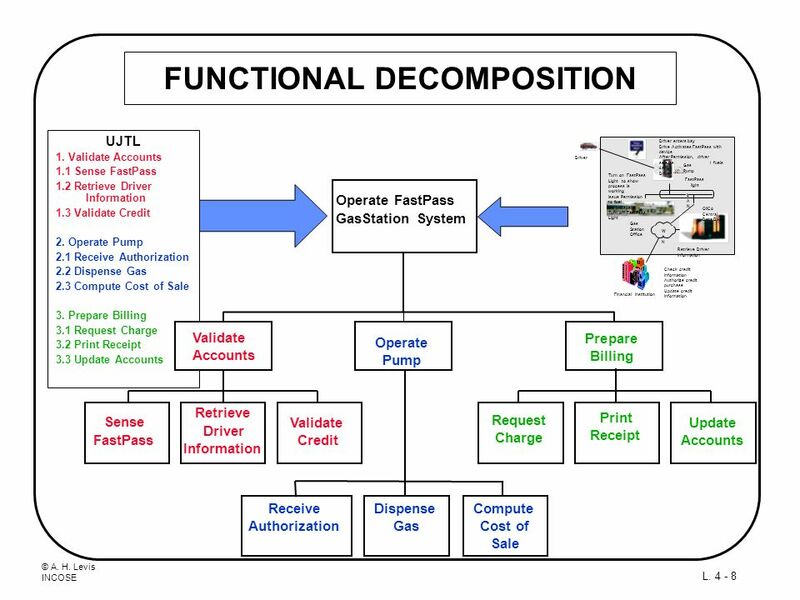 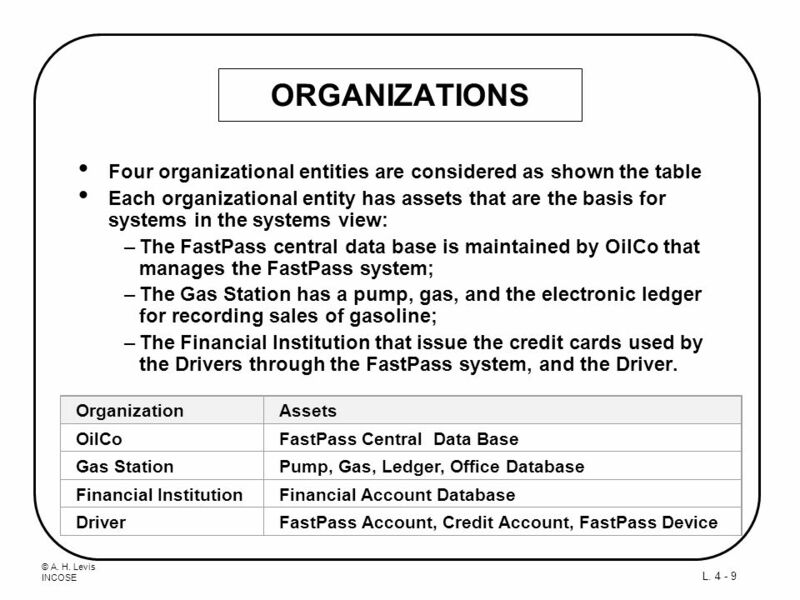 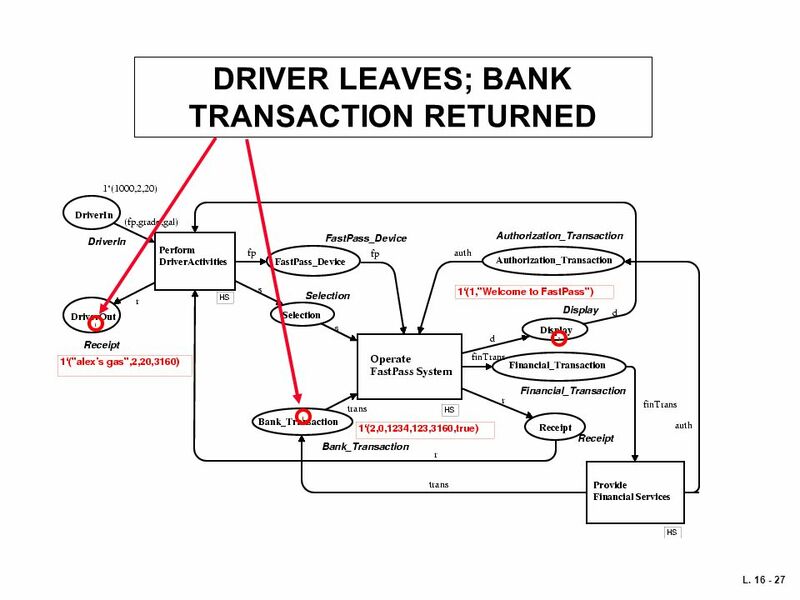 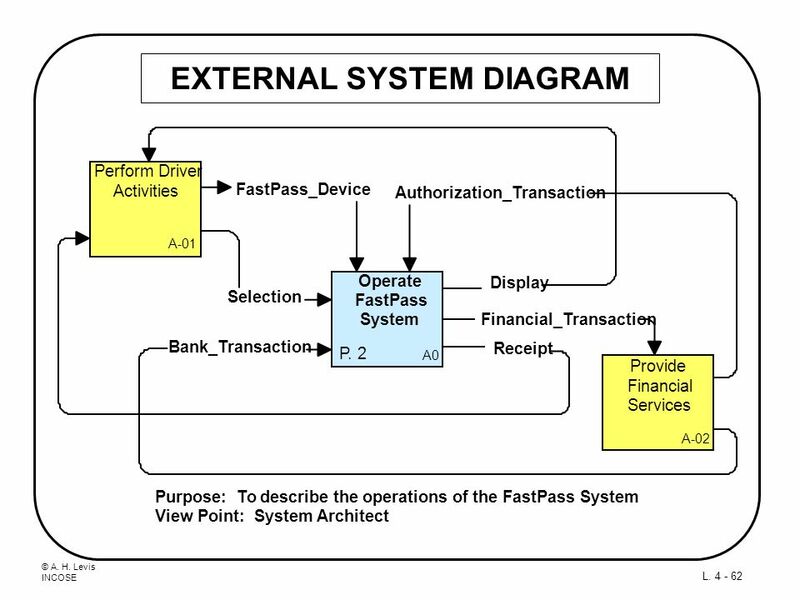 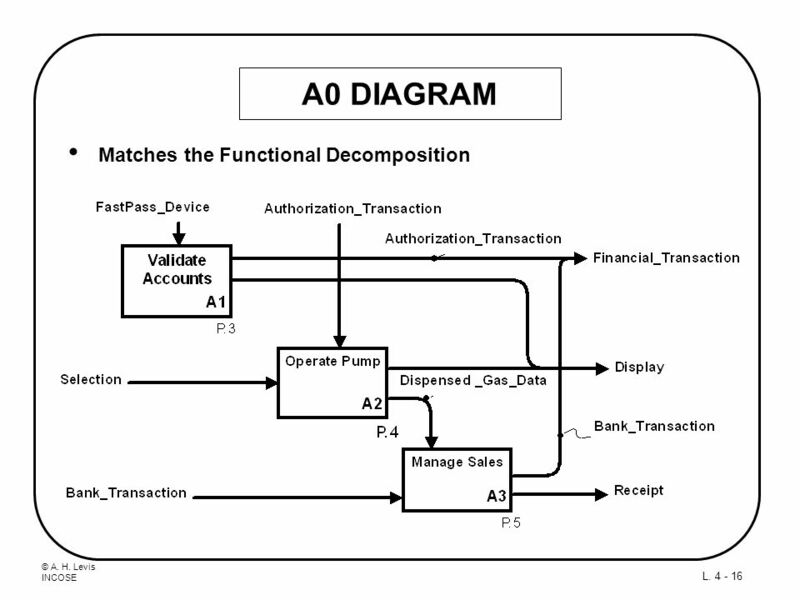 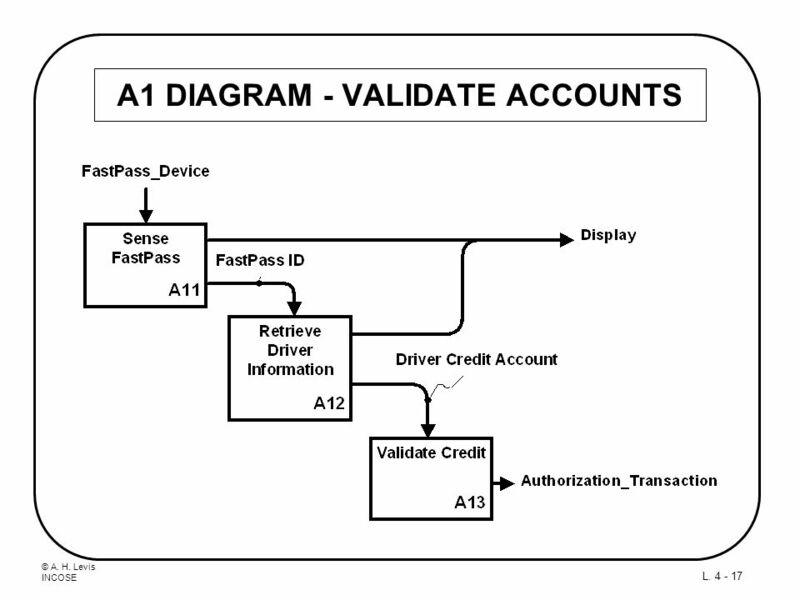 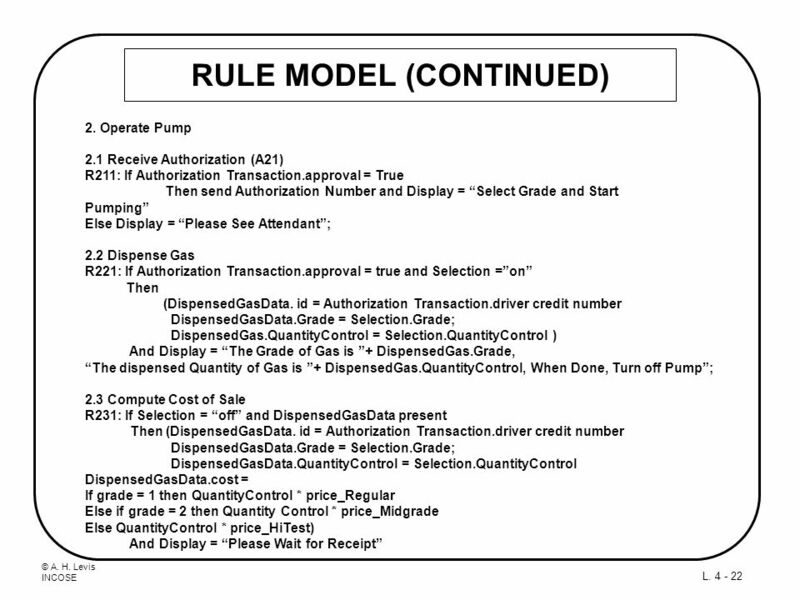 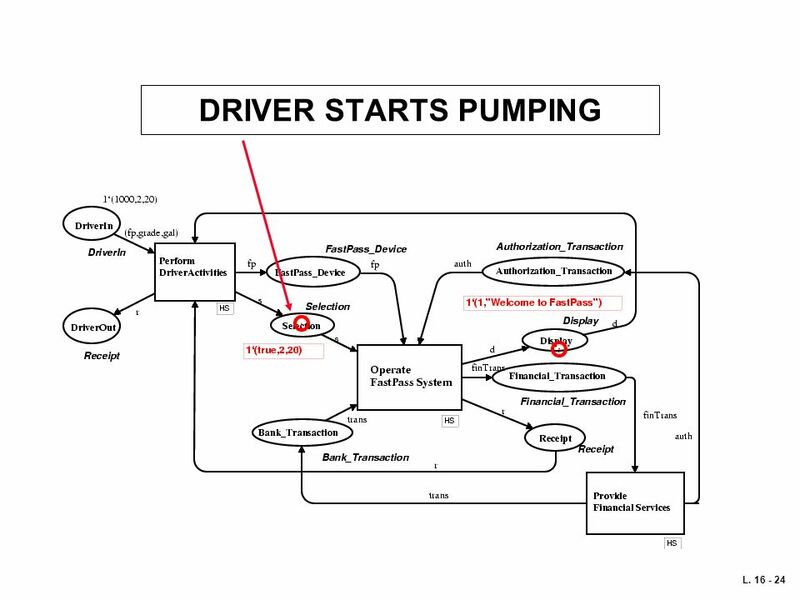 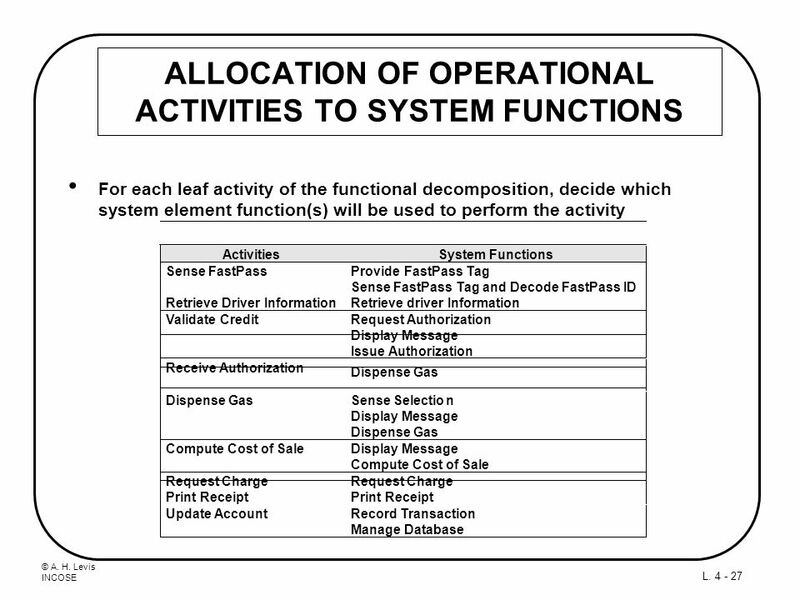 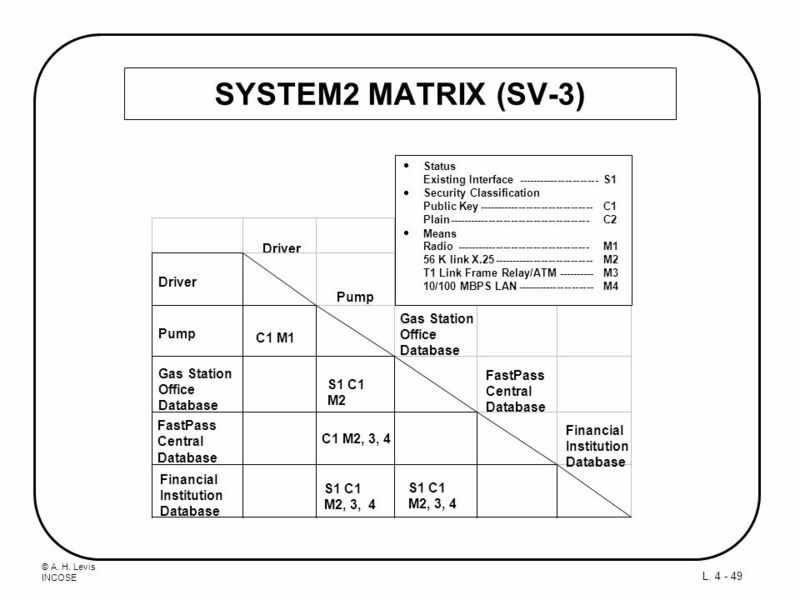 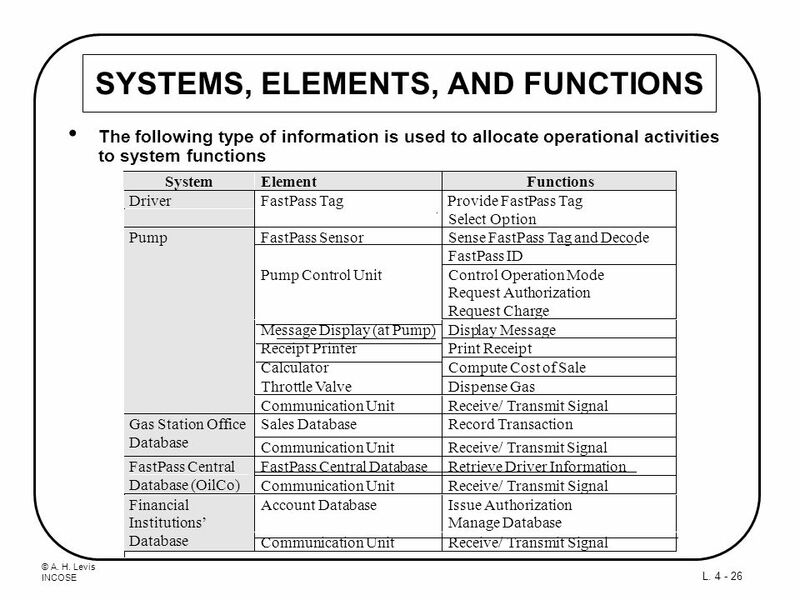 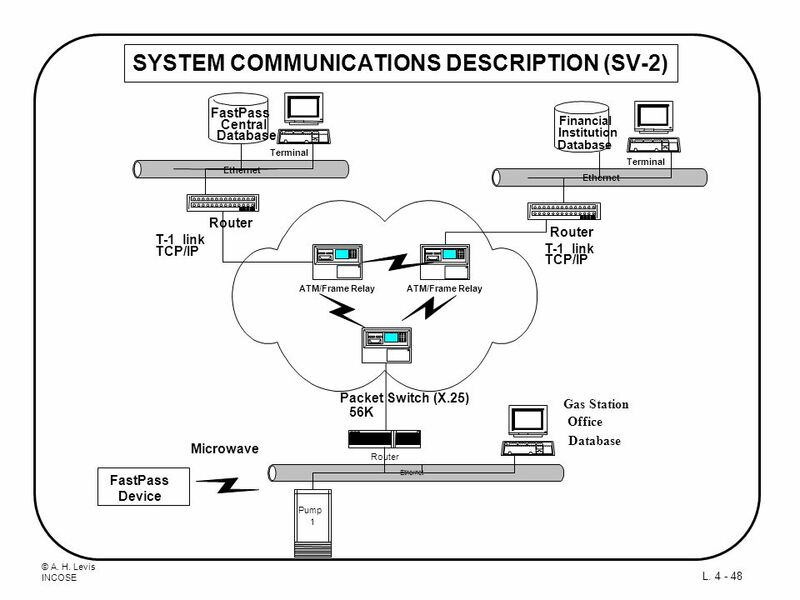 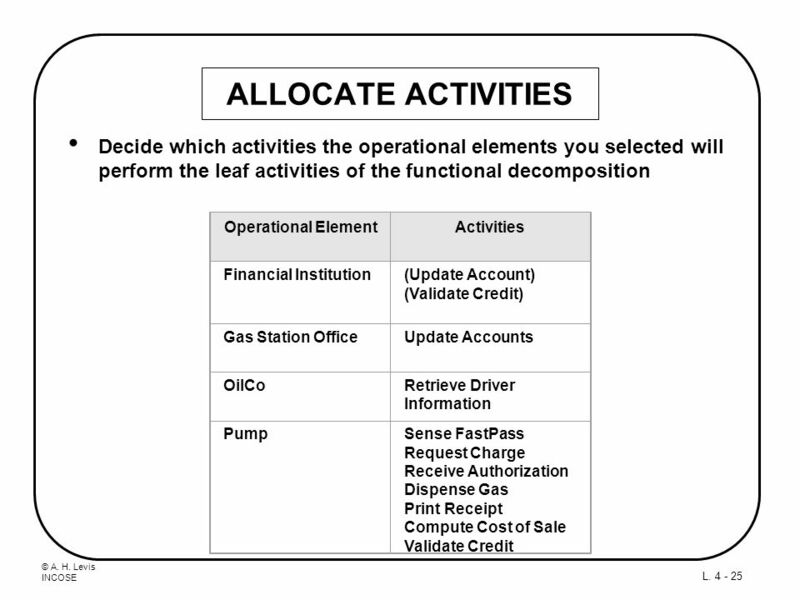 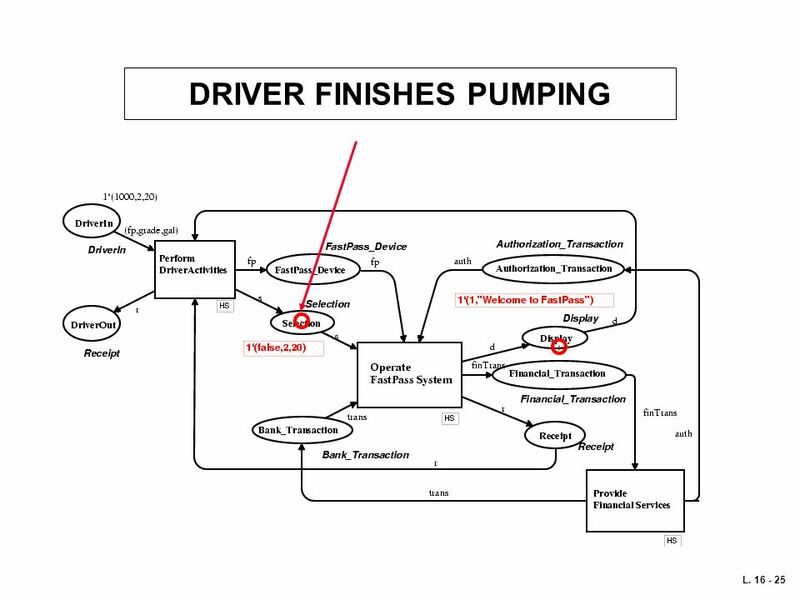 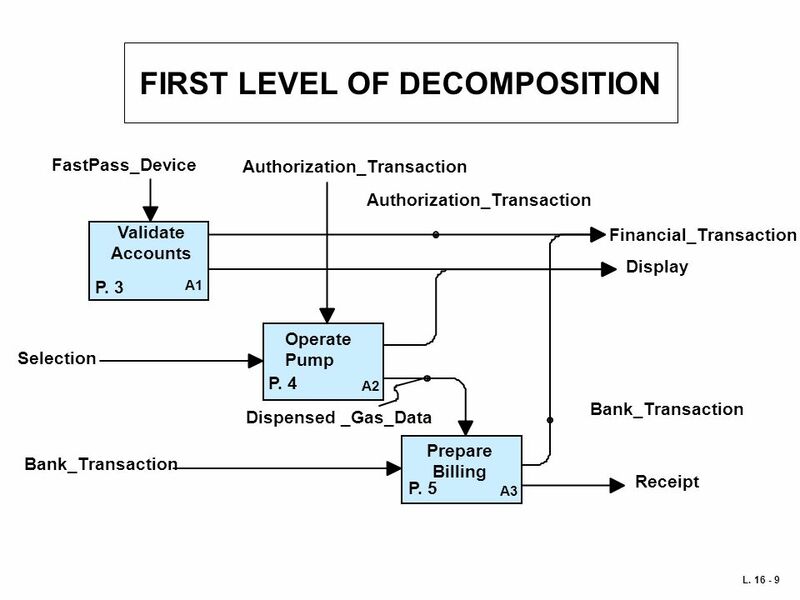 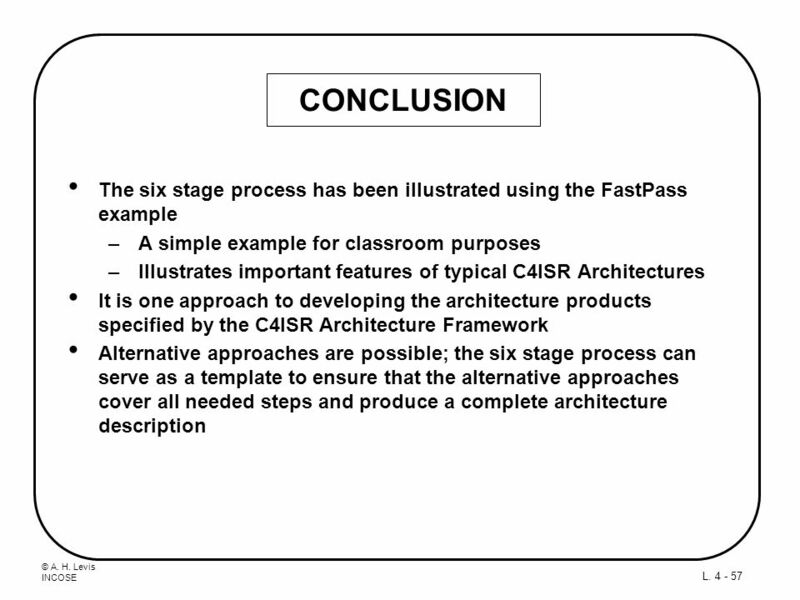 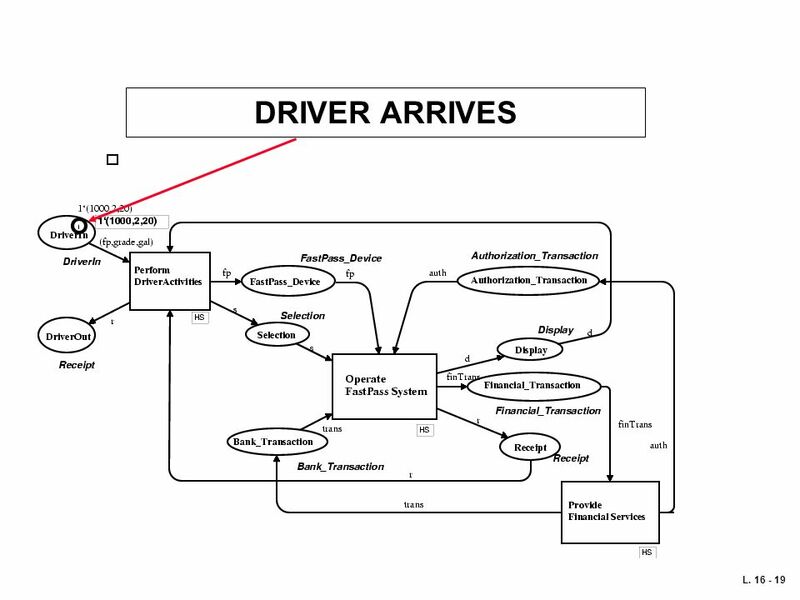 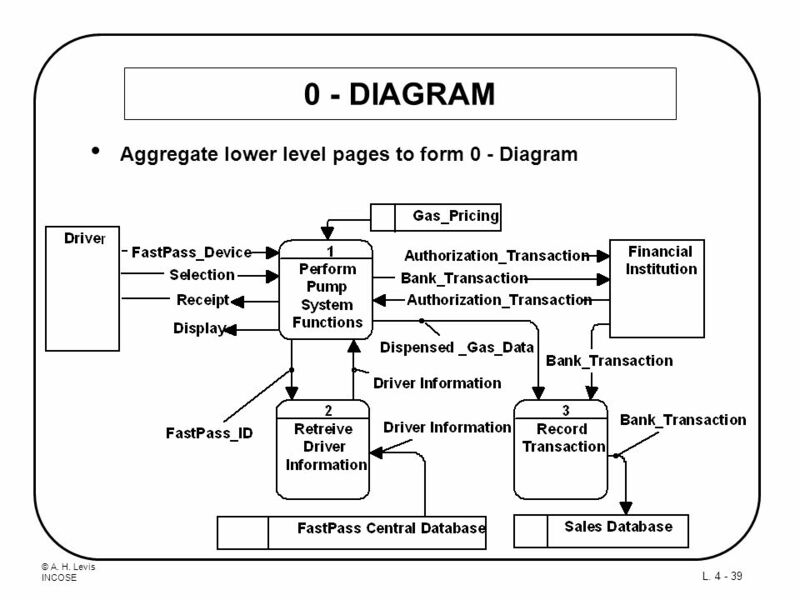 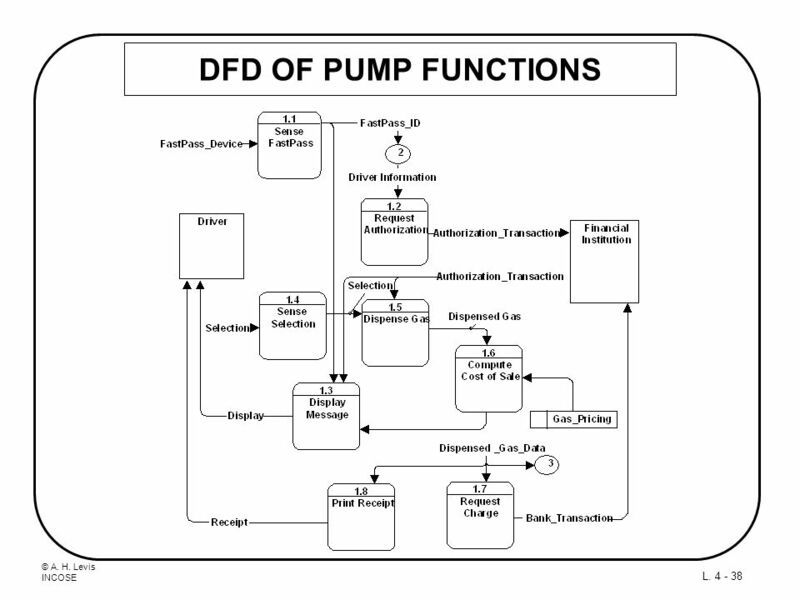 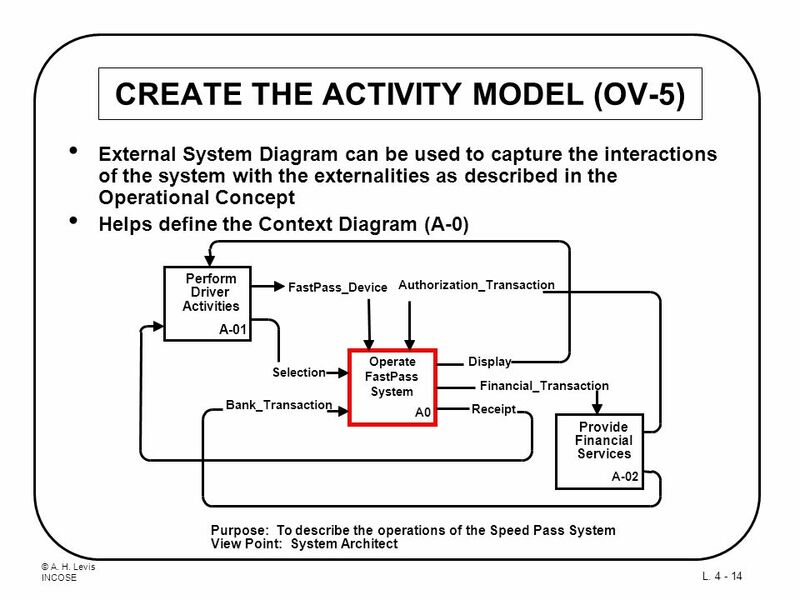 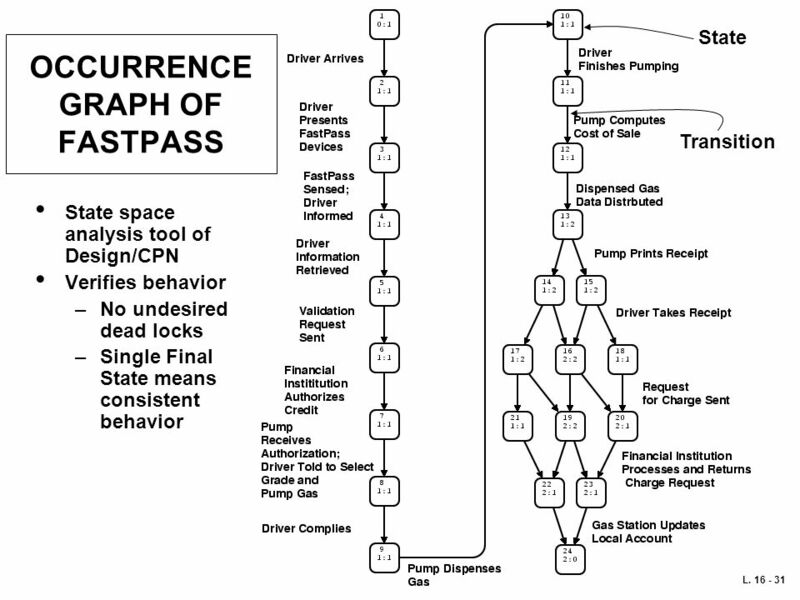 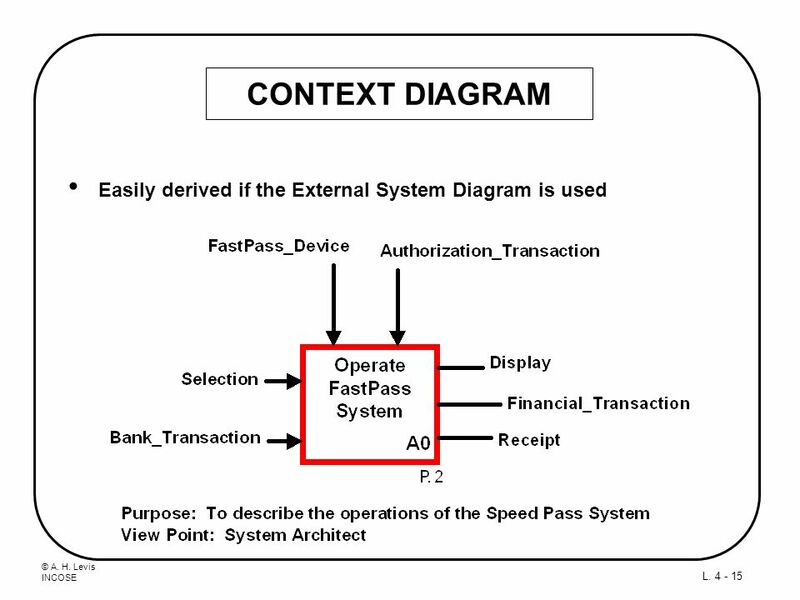 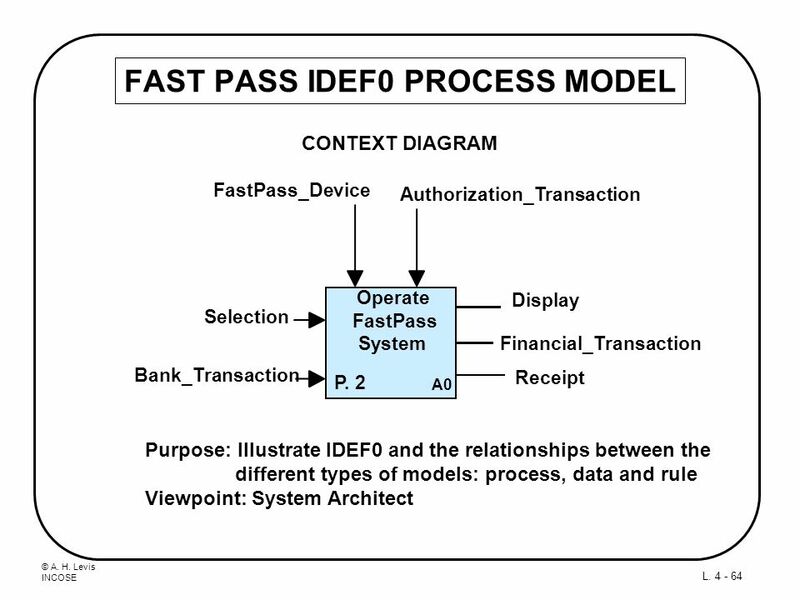 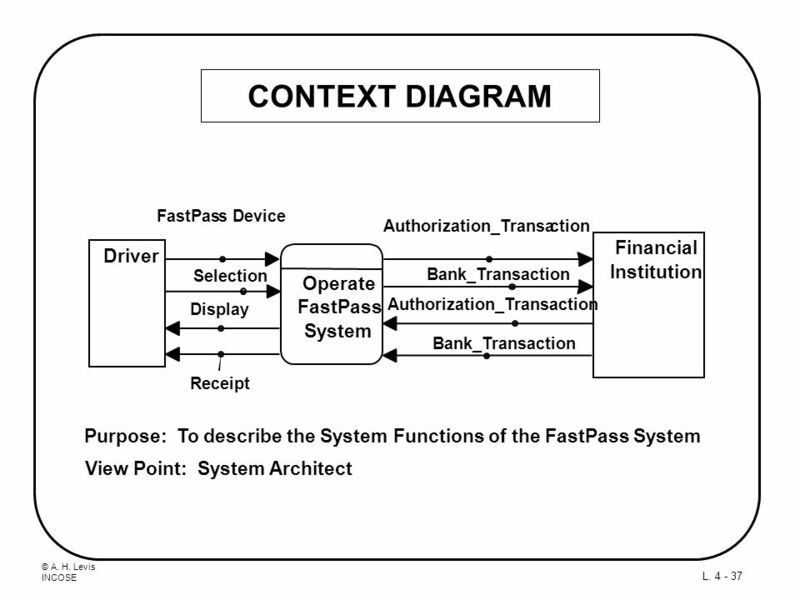 Assumes that some oil company (OilCo) has implemented a new system called FastPass. 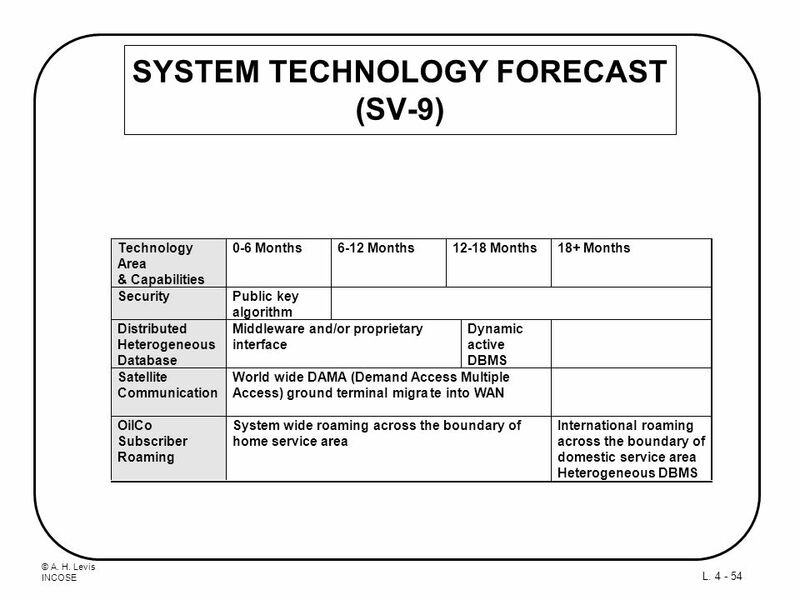 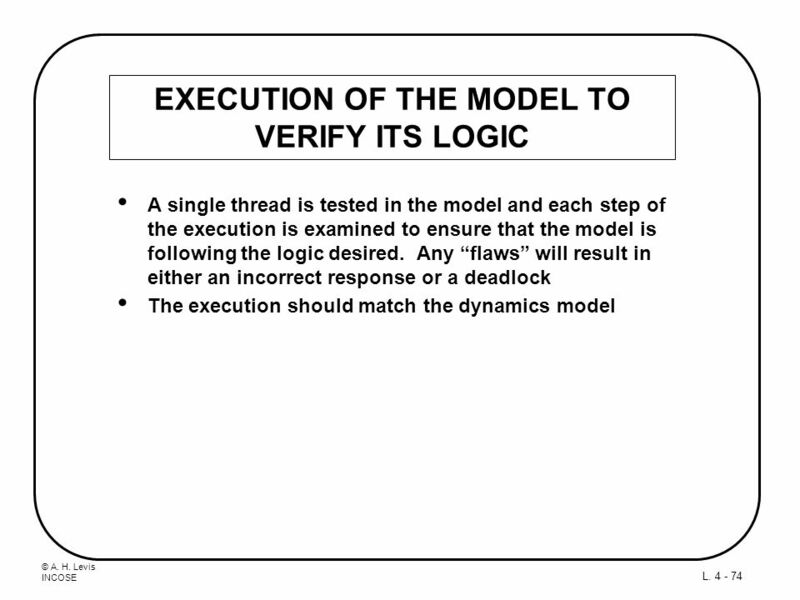 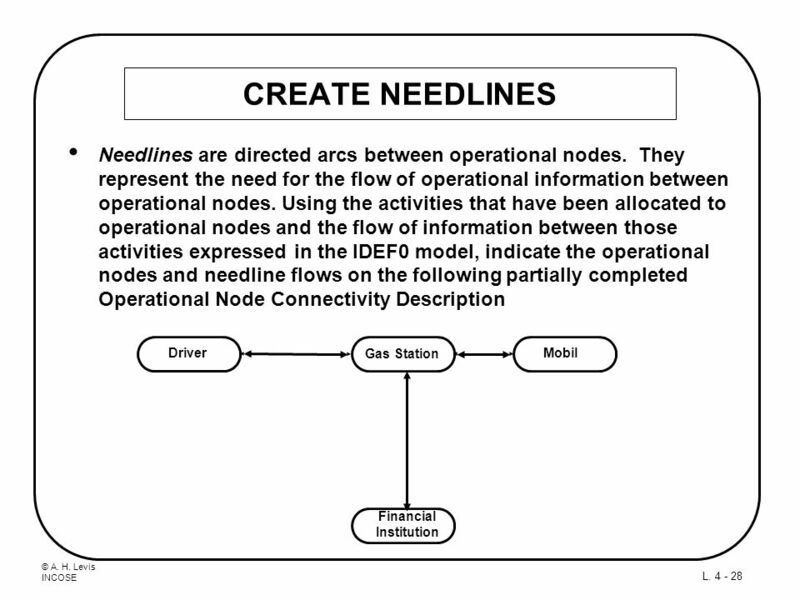 This example has been chosen in lieu of a DoD example because of its familiarity to a large audience. 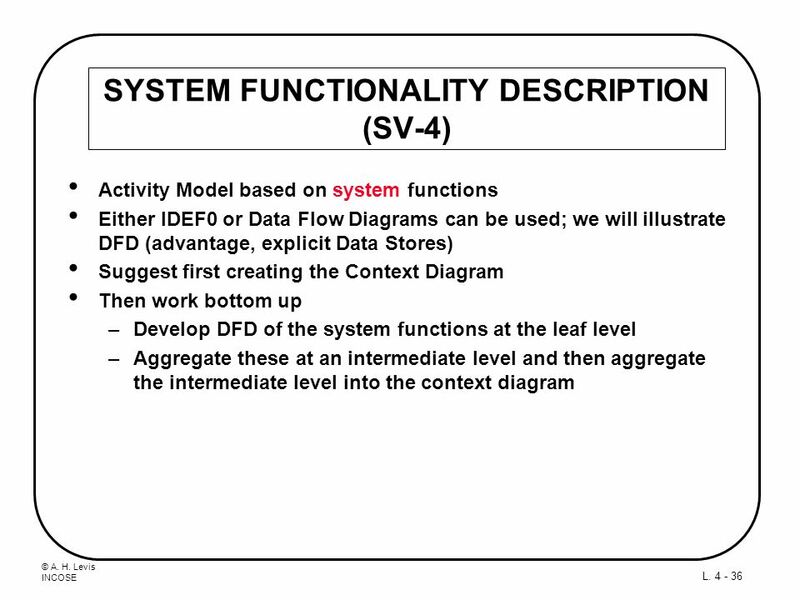 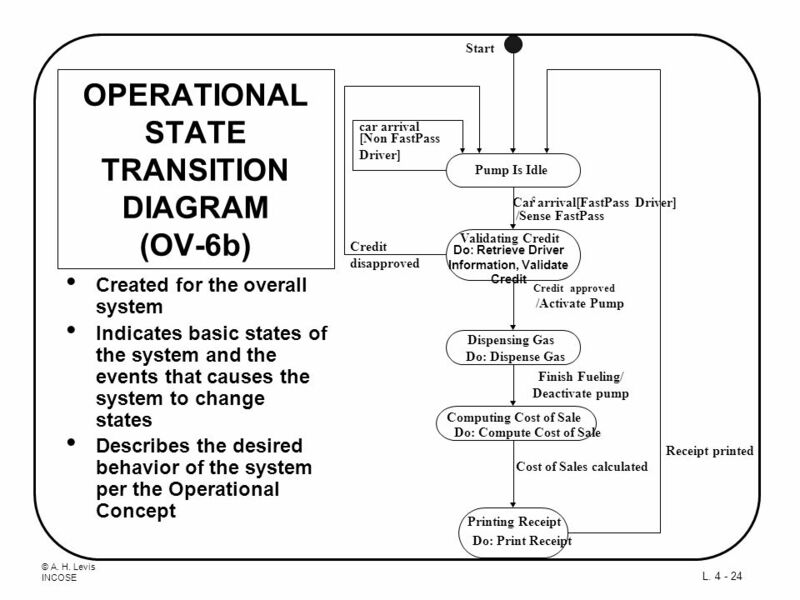 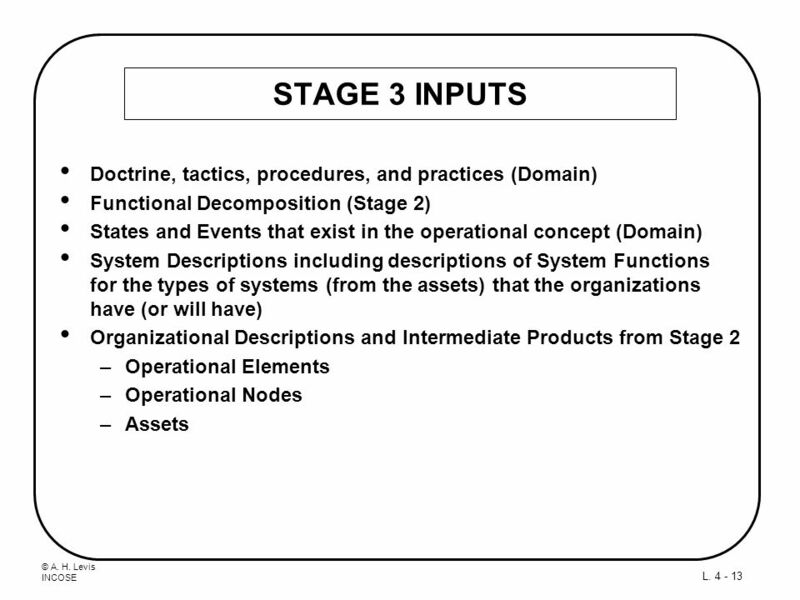 We start with a description of the goal of the system and proceed through the five stages presented in Chapter 3. 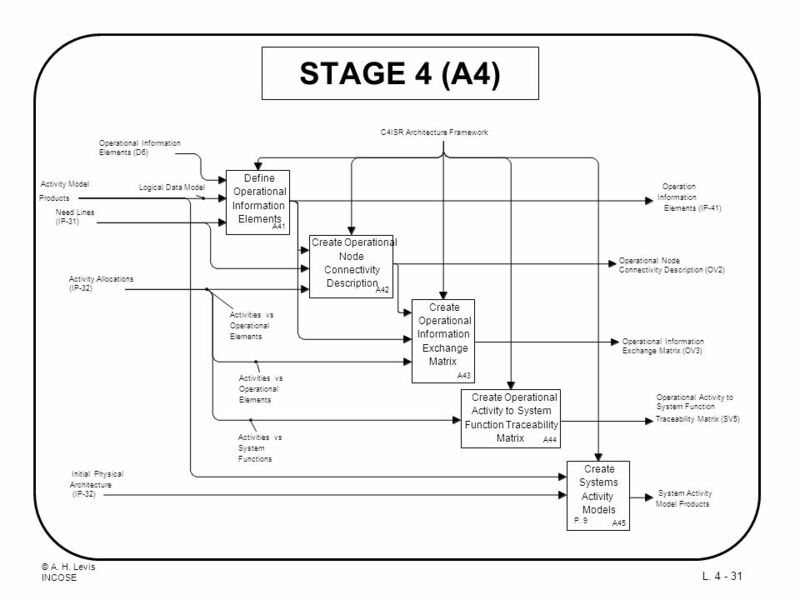 We assume that all of the initial research of Stage 0 has been completed and the input documents collected. 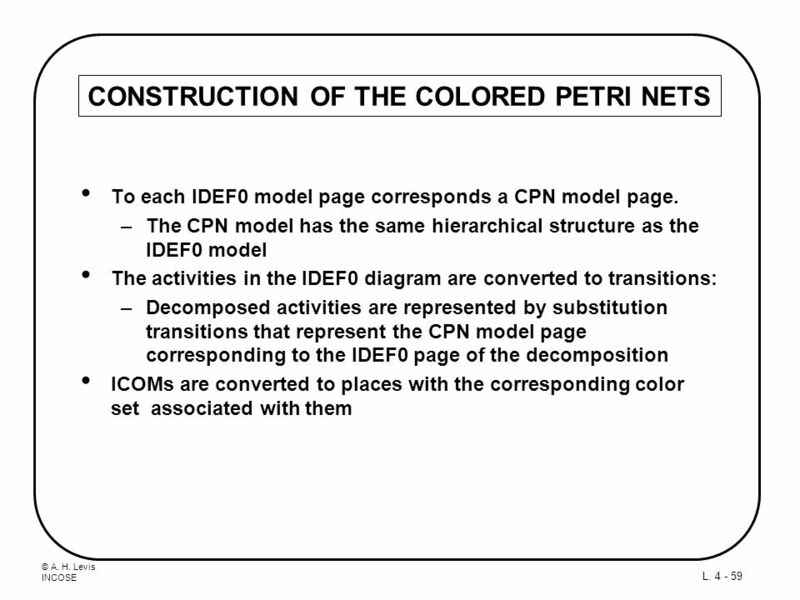 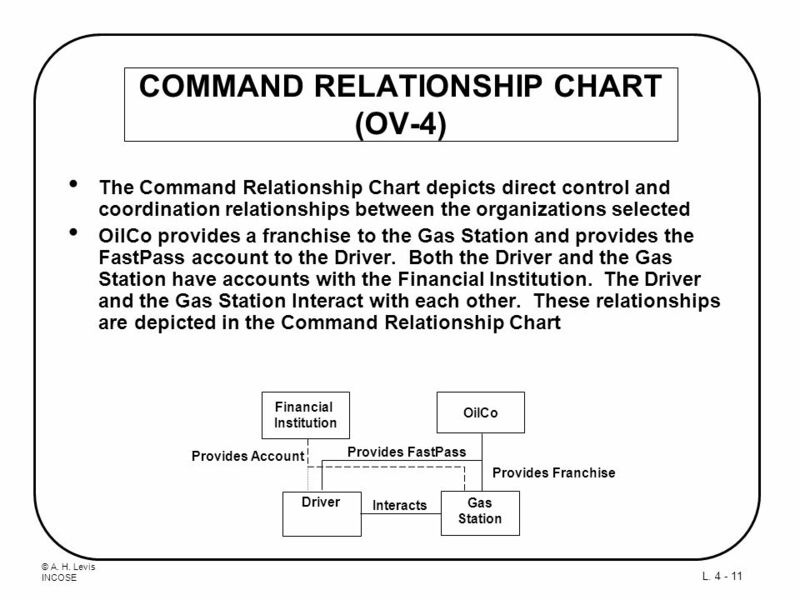 Part of this process is the gathering of information about the Operational Concept. 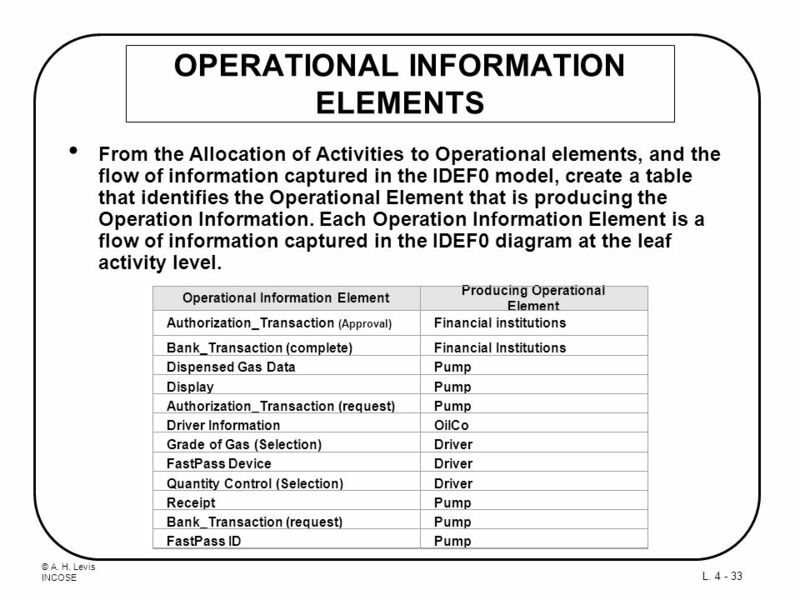 In this example, we assume that OilCo has been informed about a new technology that allows information to be encoded in a small device and be retrieved by a small radio signal. 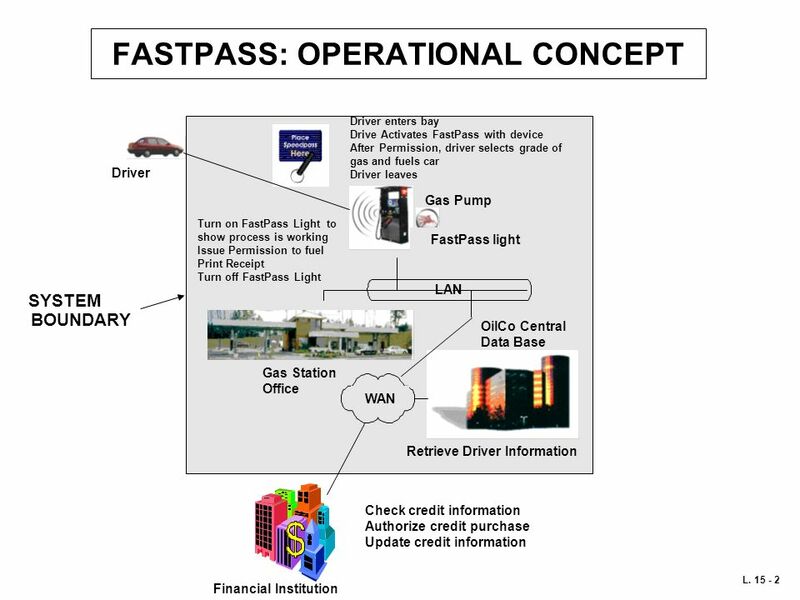 OilCo believes that such technology can be incorporated in gasoline pumps to make it more convenient for drivers to purchase gasoline via a credit card account. 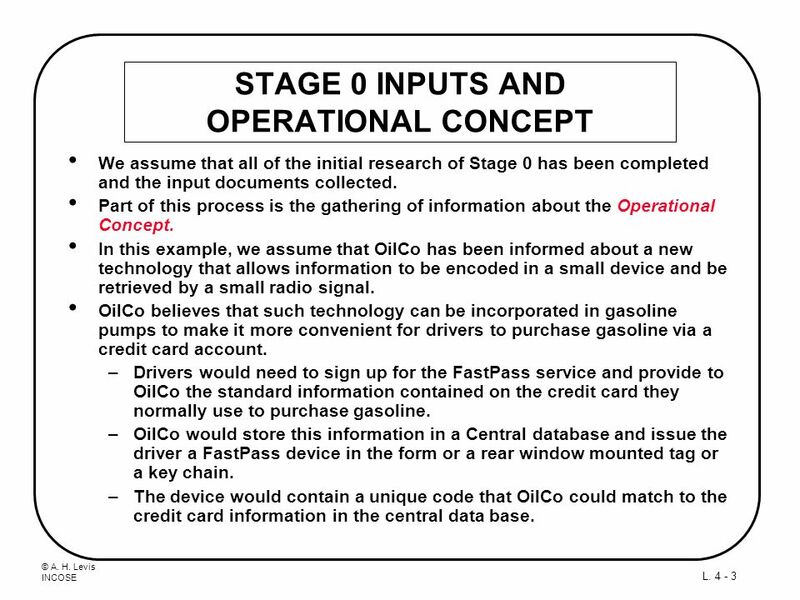 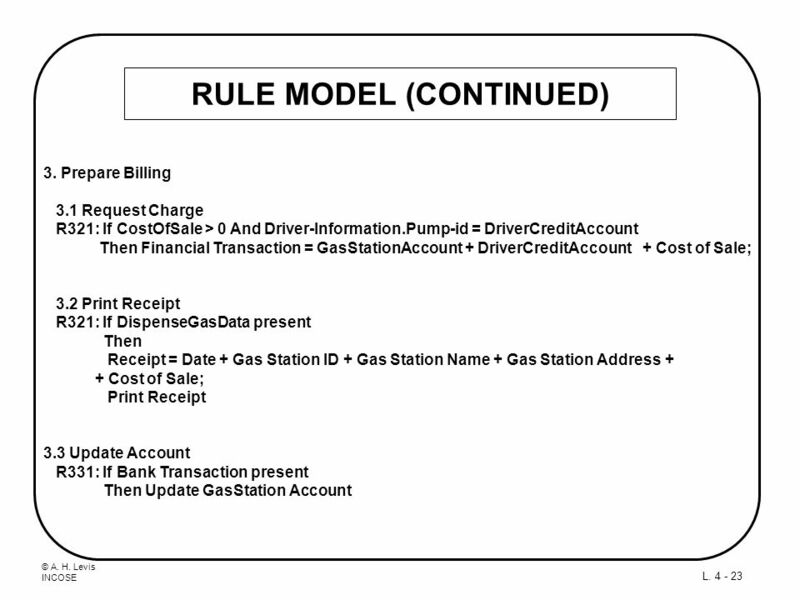 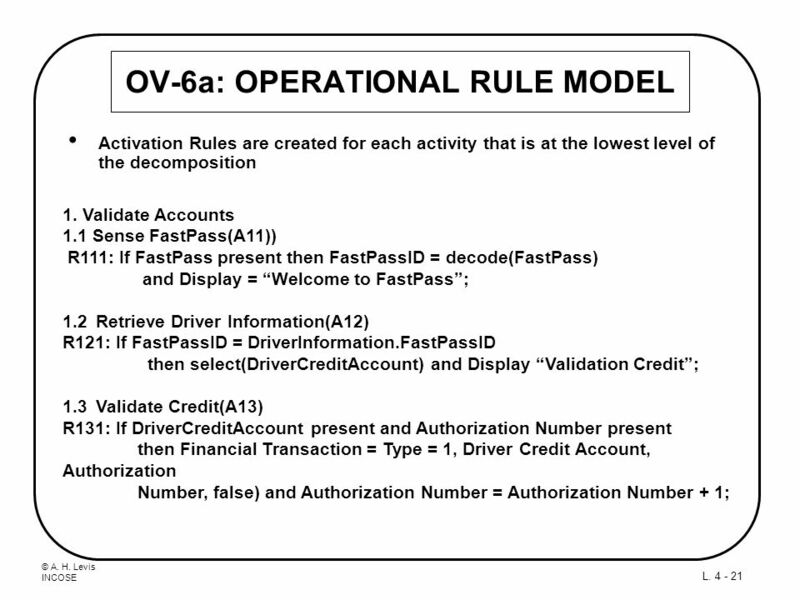 Drivers would need to sign up for the FastPass service and provide to OilCo the standard information contained on the credit card they normally use to purchase gasoline. 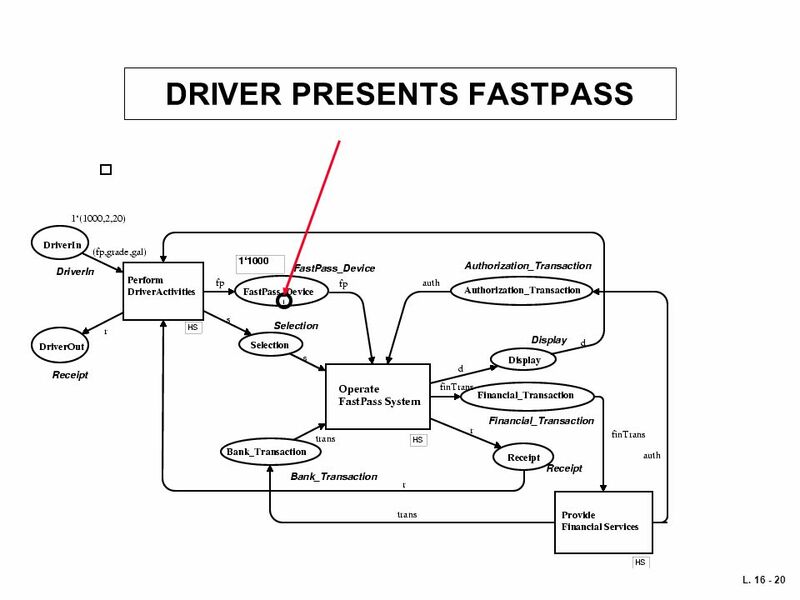 OilCo would store this information in a Central database and issue the driver a FastPass device in the form or a rear window mounted tag or a key chain. 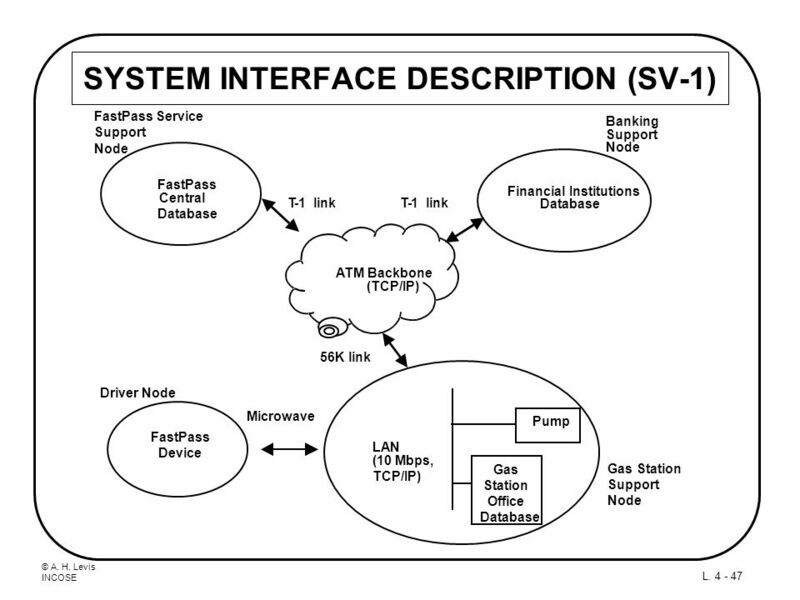 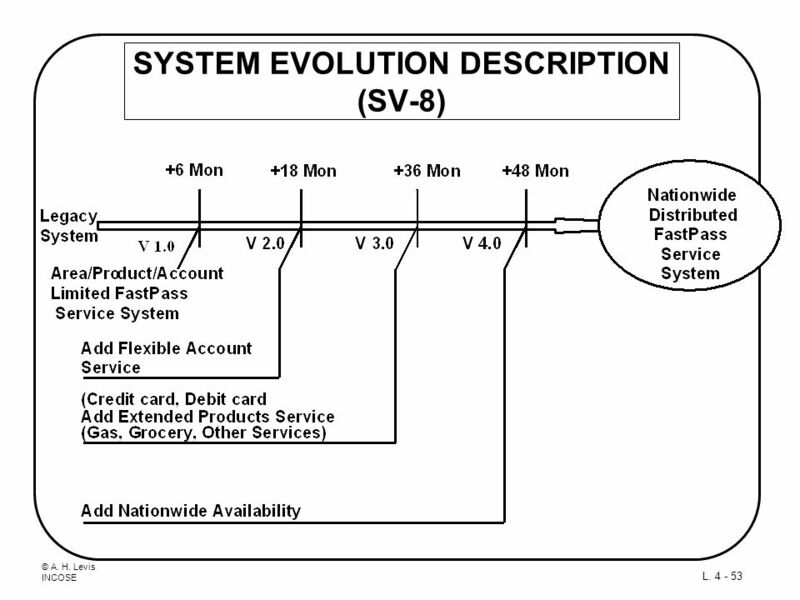 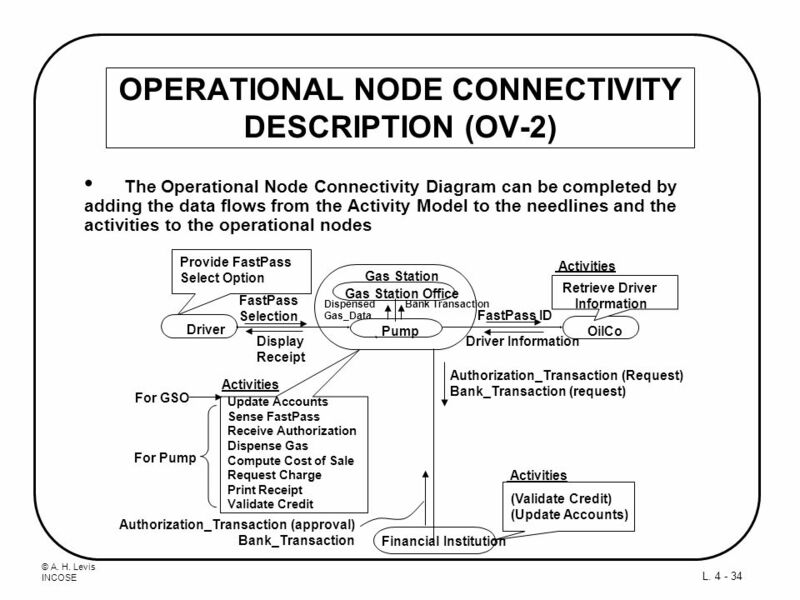 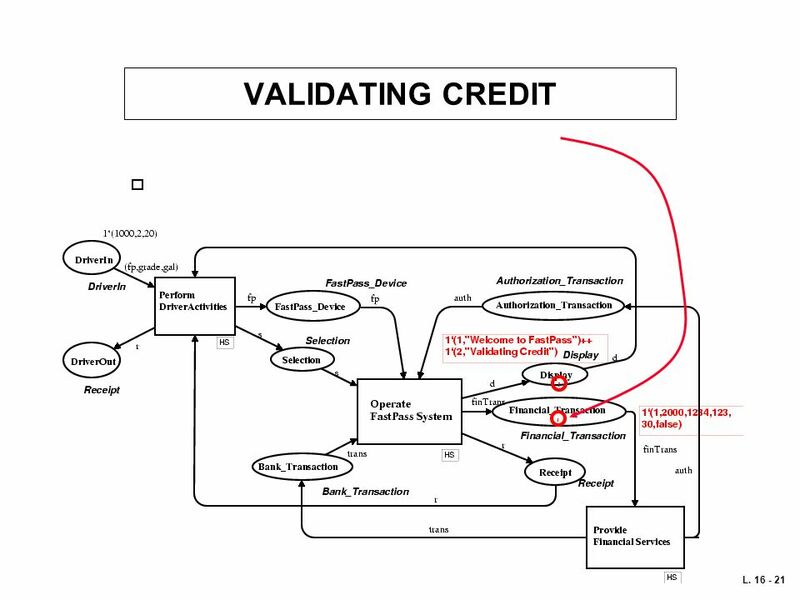 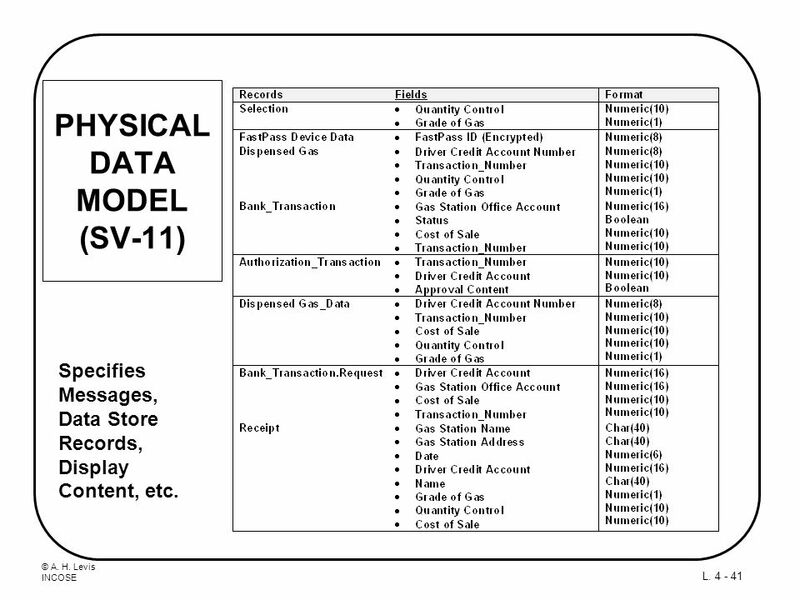 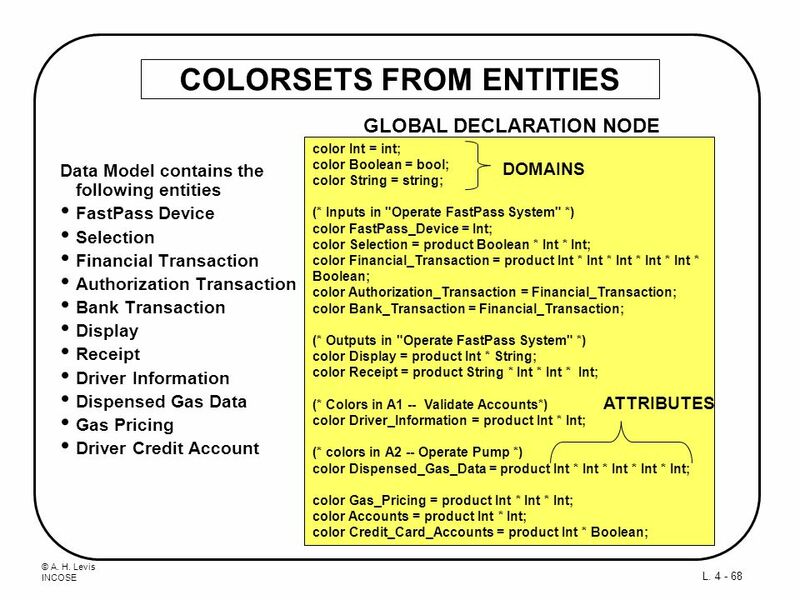 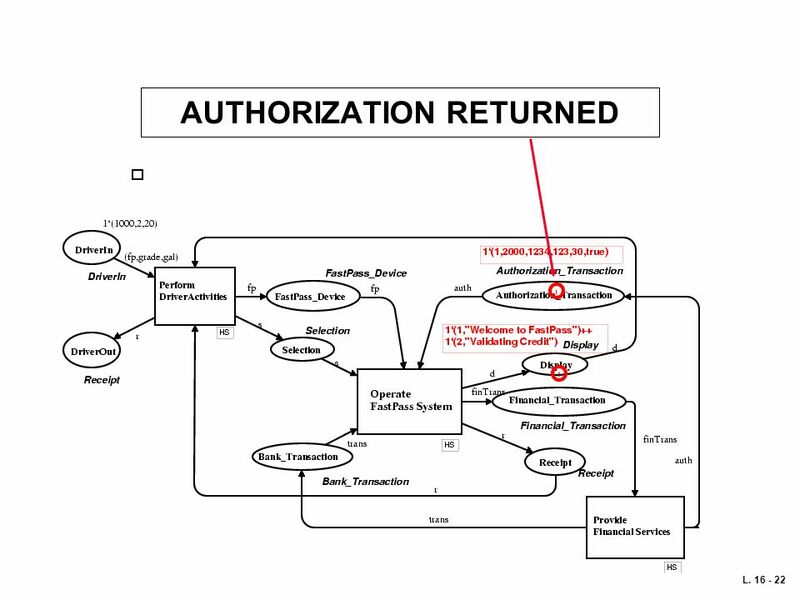 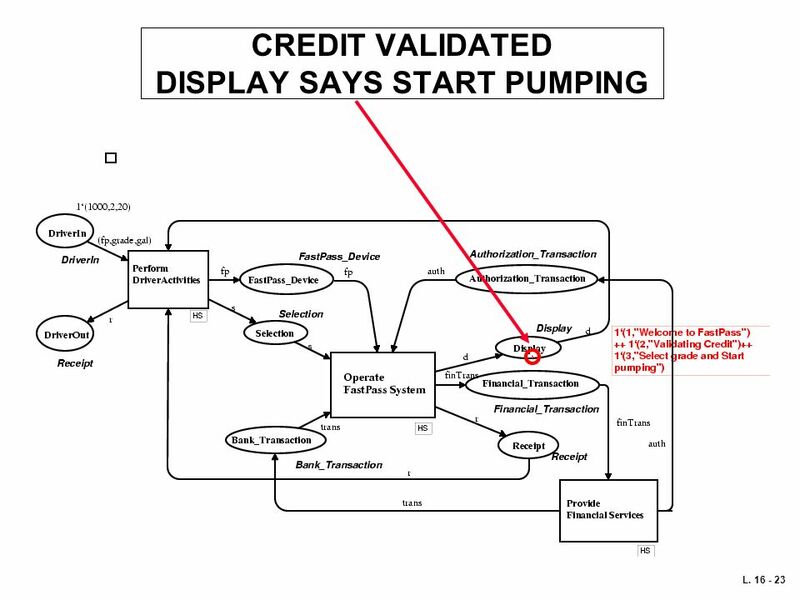 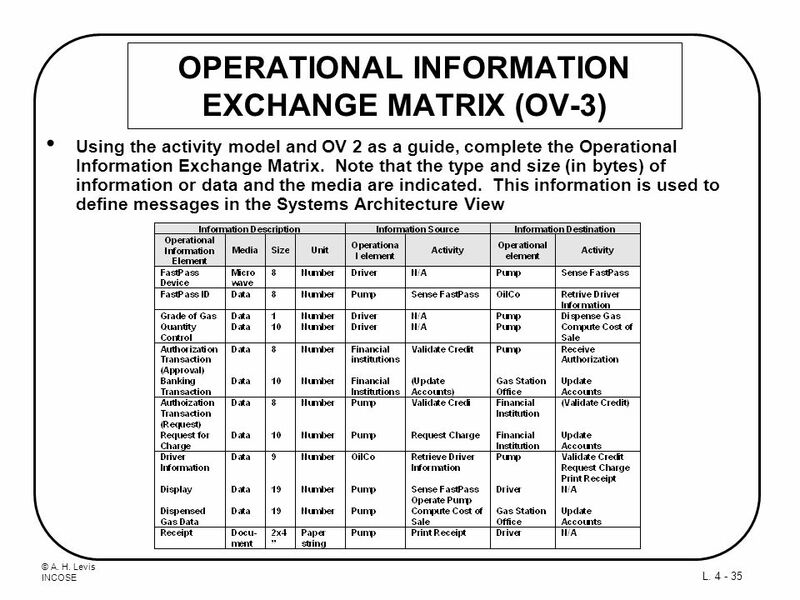 The device would contain a unique code that OilCo could match to the credit card information in the central data base. 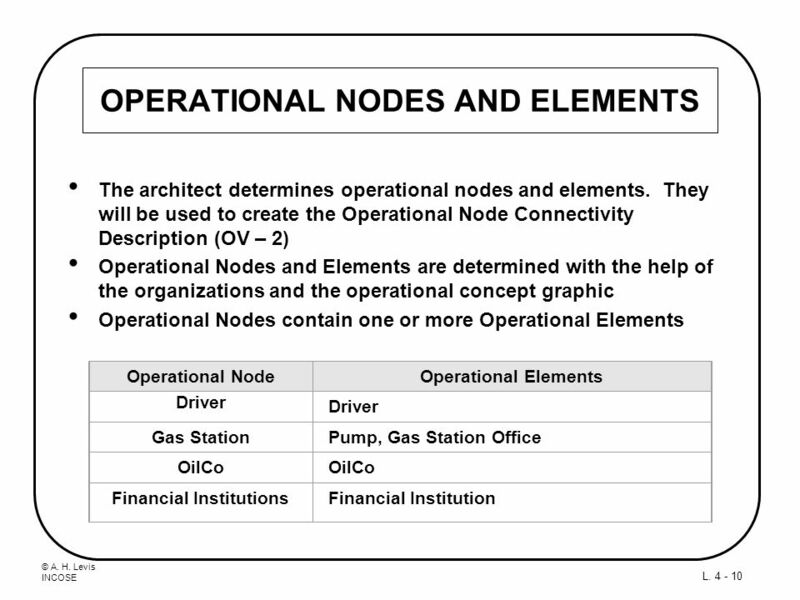 The system components and elements that will be used have been determined; assign them to system nodes. 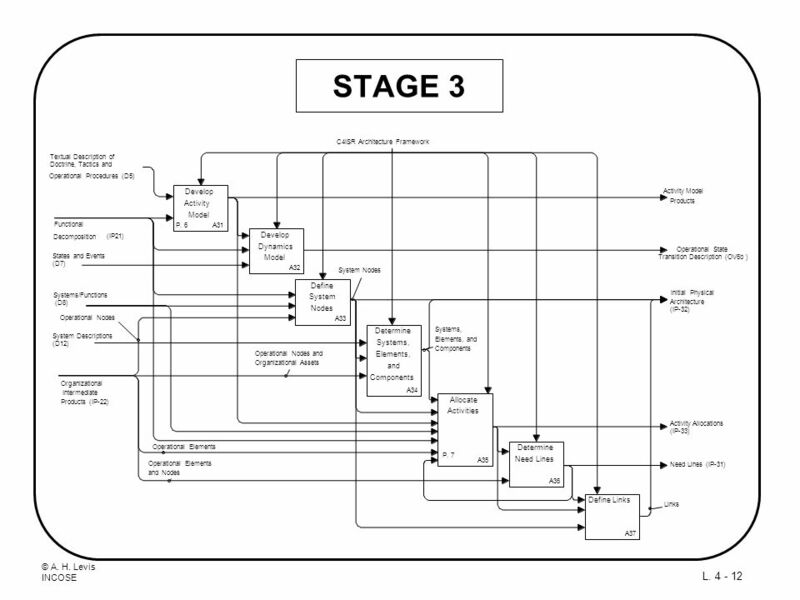 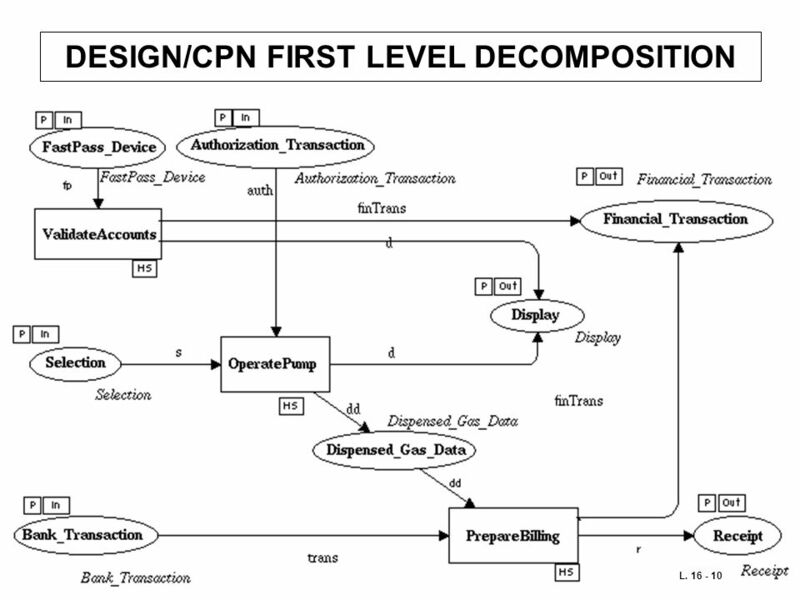 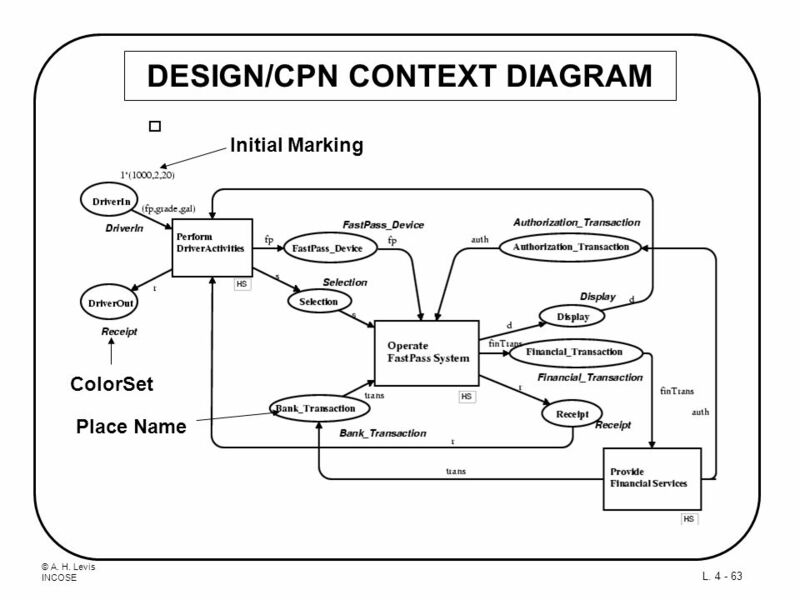 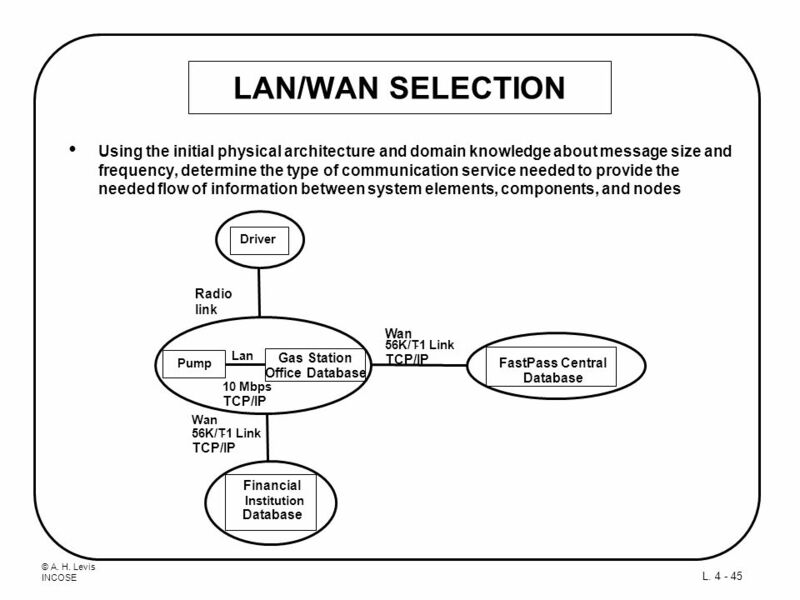 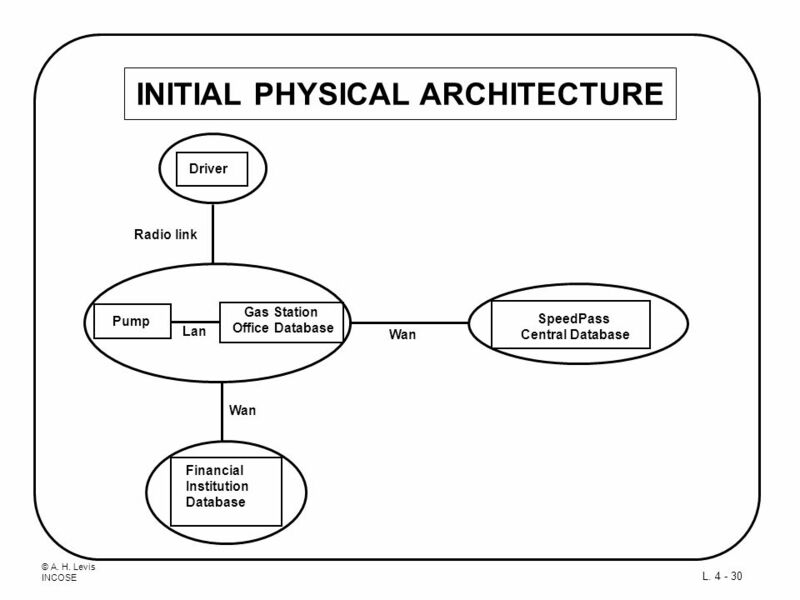 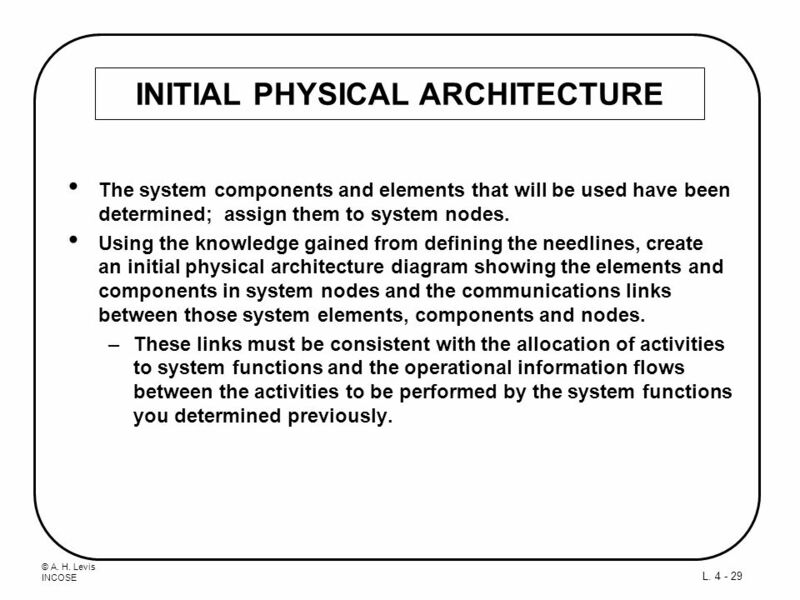 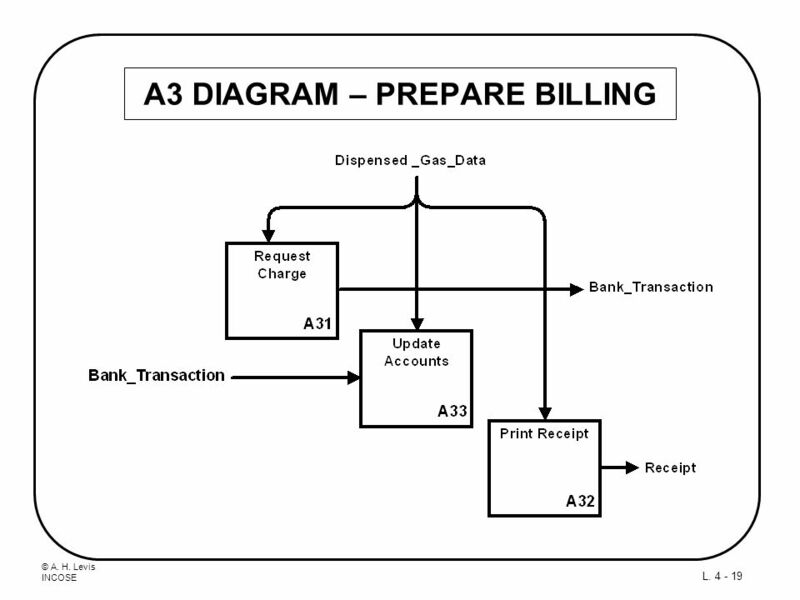 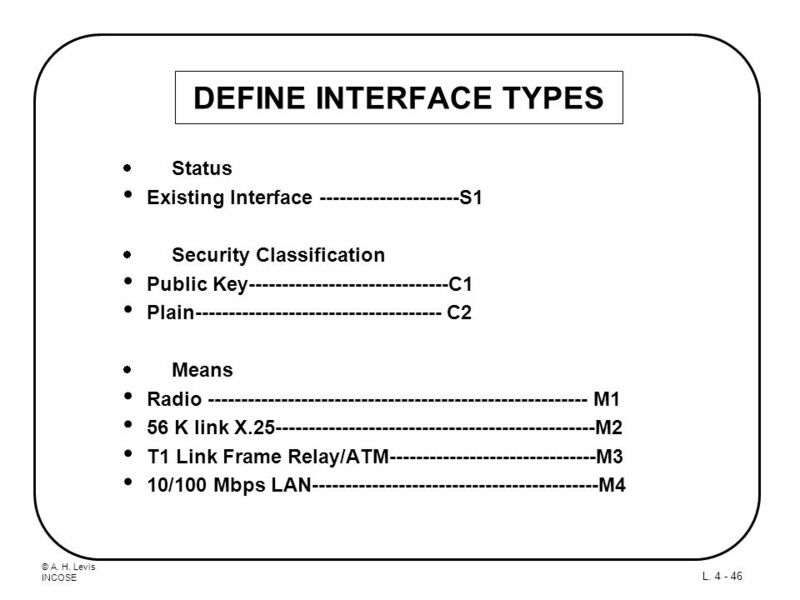 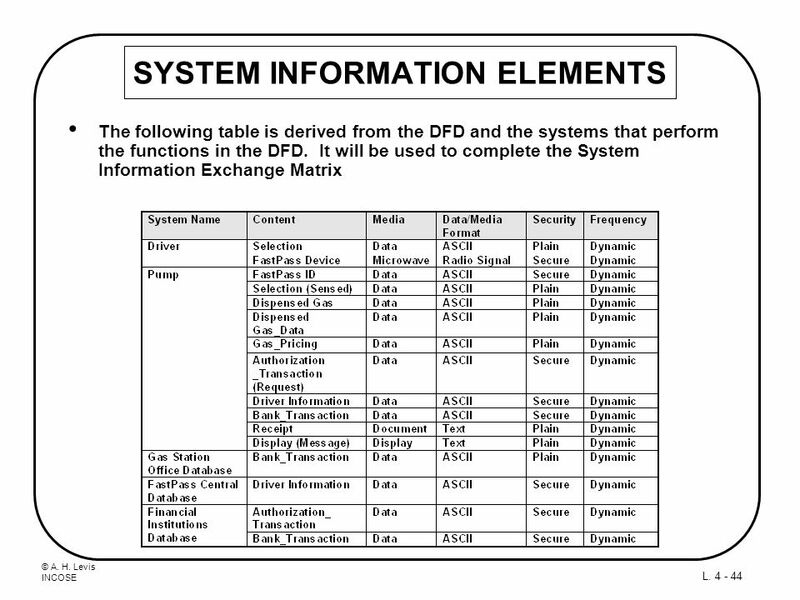 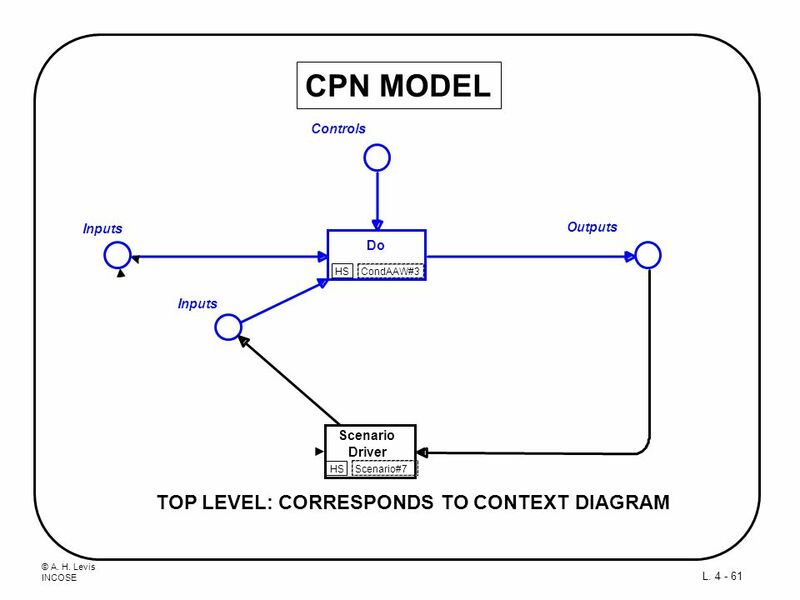 Using the knowledge gained from defining the needlines, create an initial physical architecture diagram showing the elements and components in system nodes and the communications links between those system elements, components and nodes. 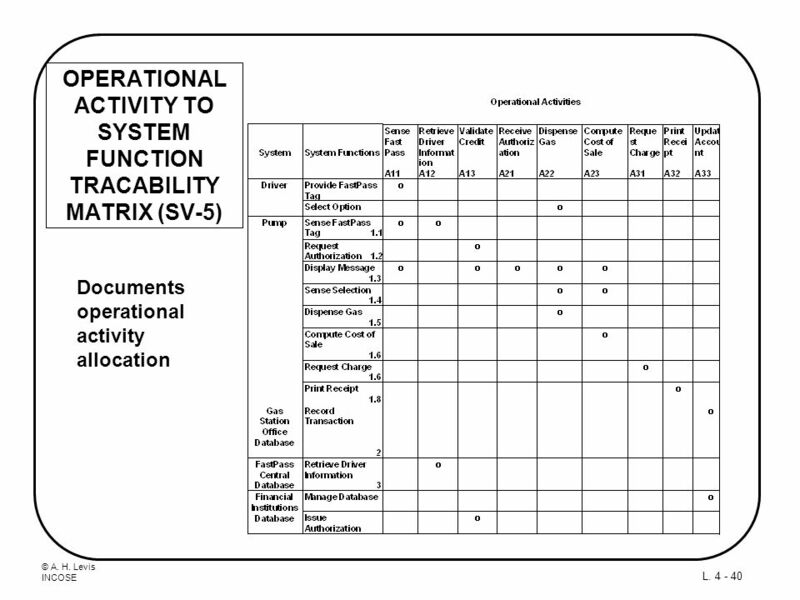 These links must be consistent with the allocation of activities to system functions and the operational information flows between the activities to be performed by the system functions you determined previously. 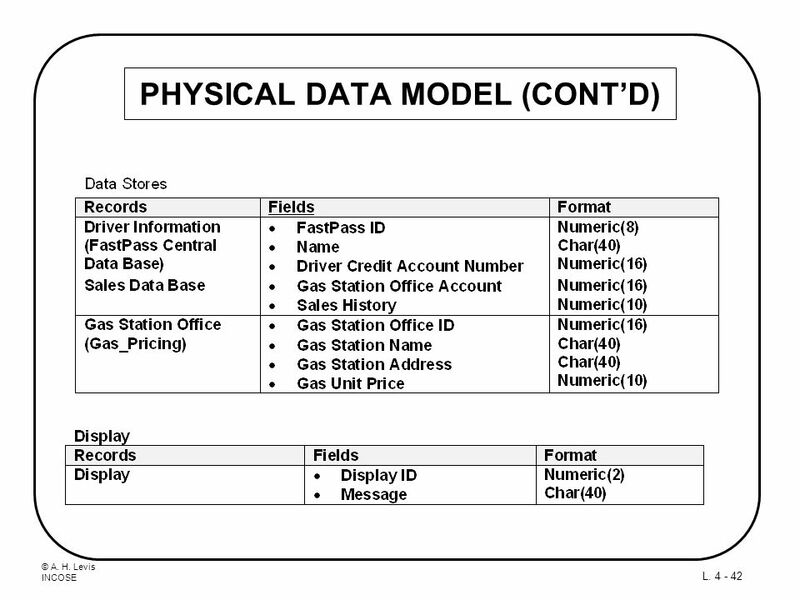 Specifies Messages, Data Store Records, Display Content, etc. 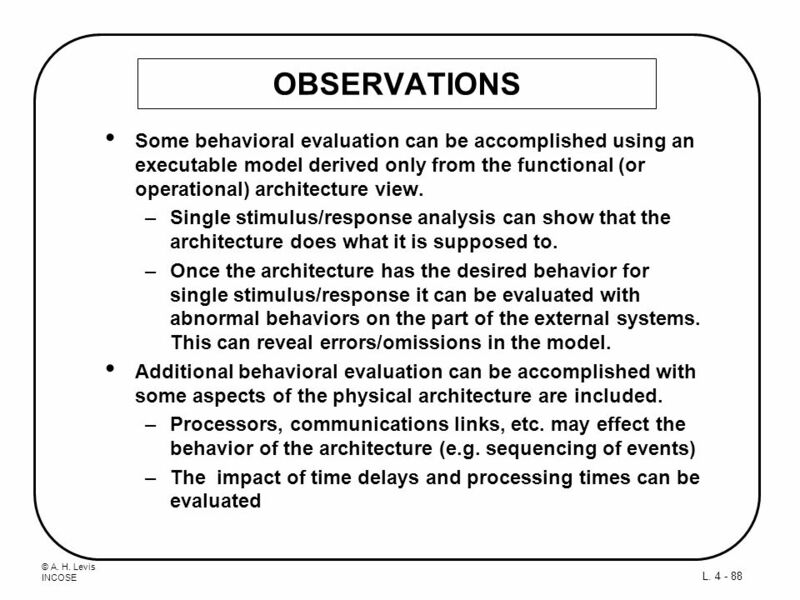 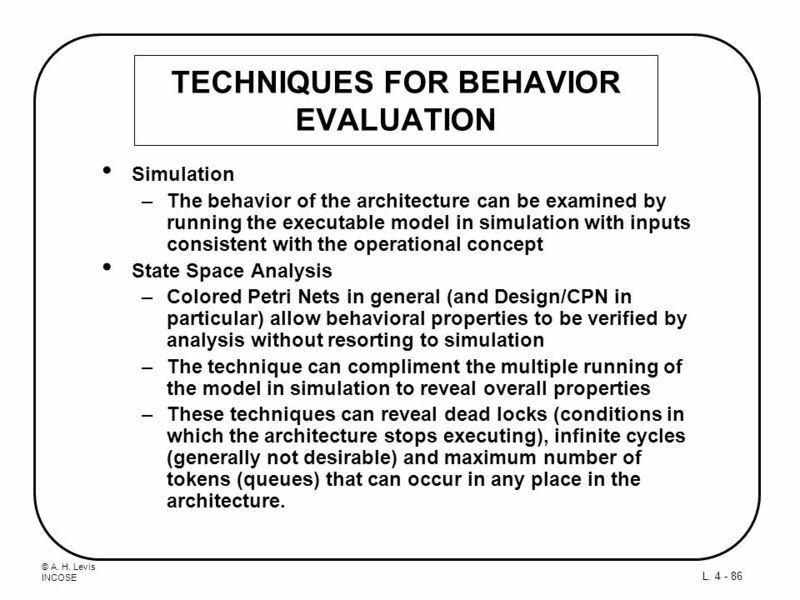 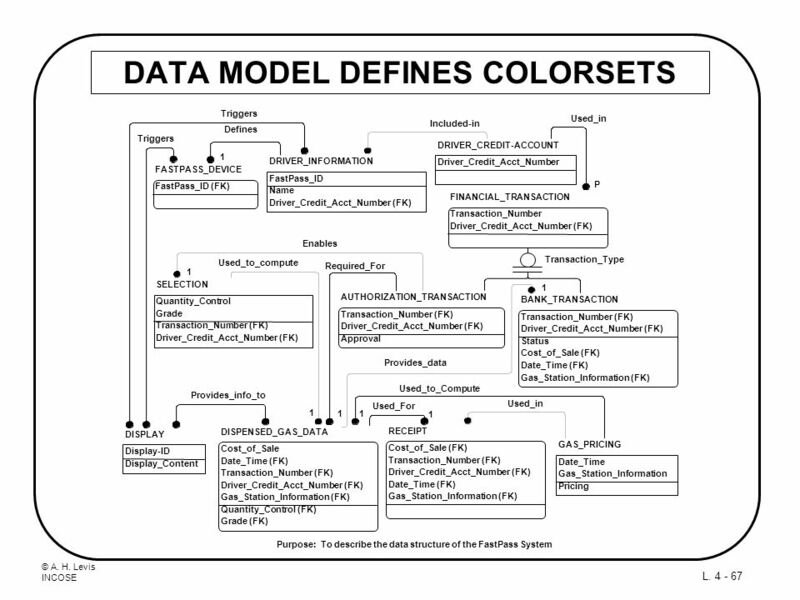 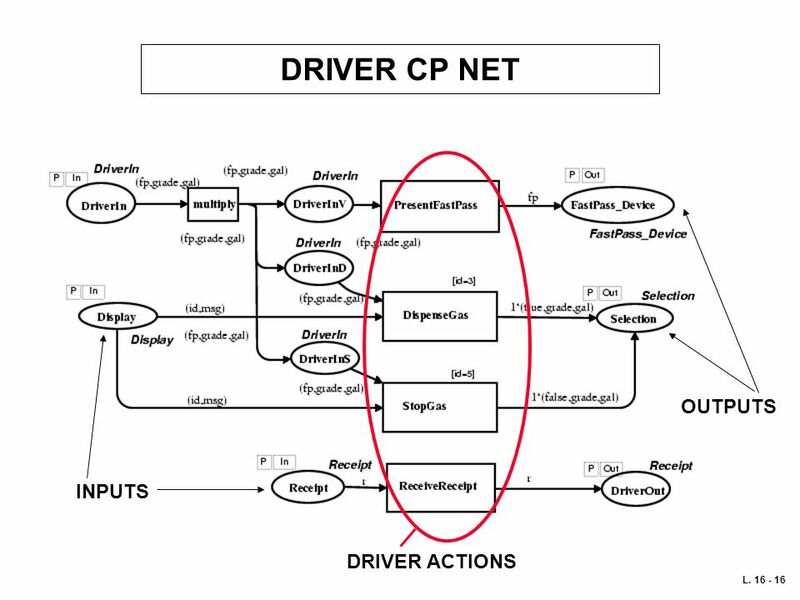 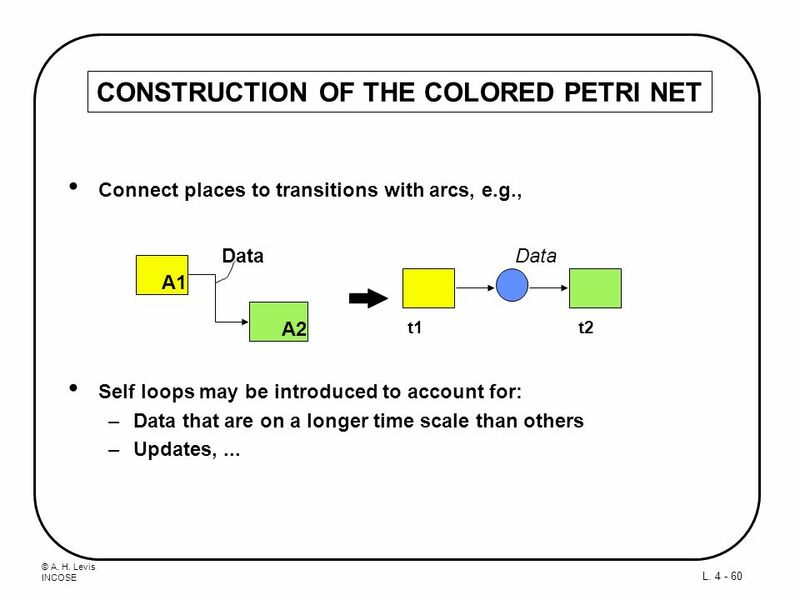 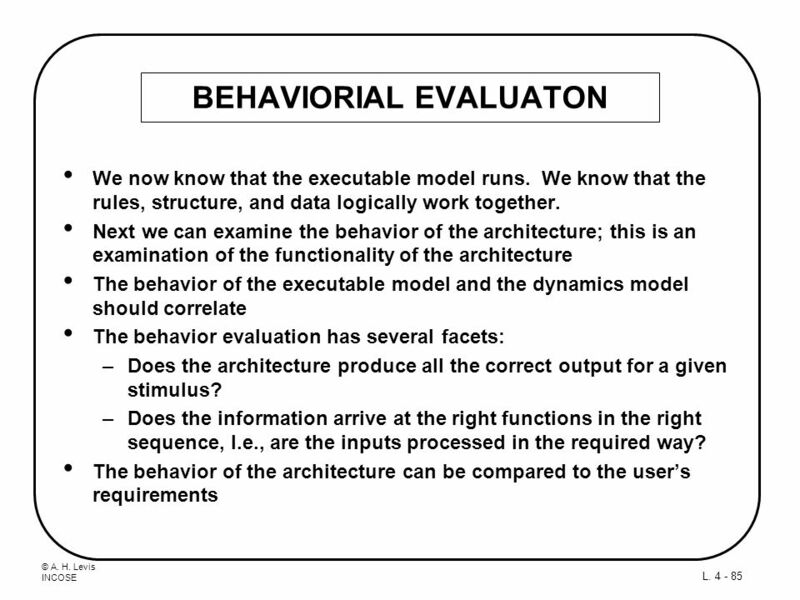 Simulation The behavior of the architecture can be examined by running the executable model in simulation with inputs consistent with the operational concept State Space Analysis Colored Petri Nets in general (and Design/CPN in particular) allow behavioral properties to be verified by analysis without resorting to simulation The technique can compliment the multiple running of the model in simulation to reveal overall properties These techniques can reveal dead locks (conditions in which the architecture stops executing), infinite cycles (generally not desirable) and maximum number of tokens (queues) that can occur in any place in the architecture. 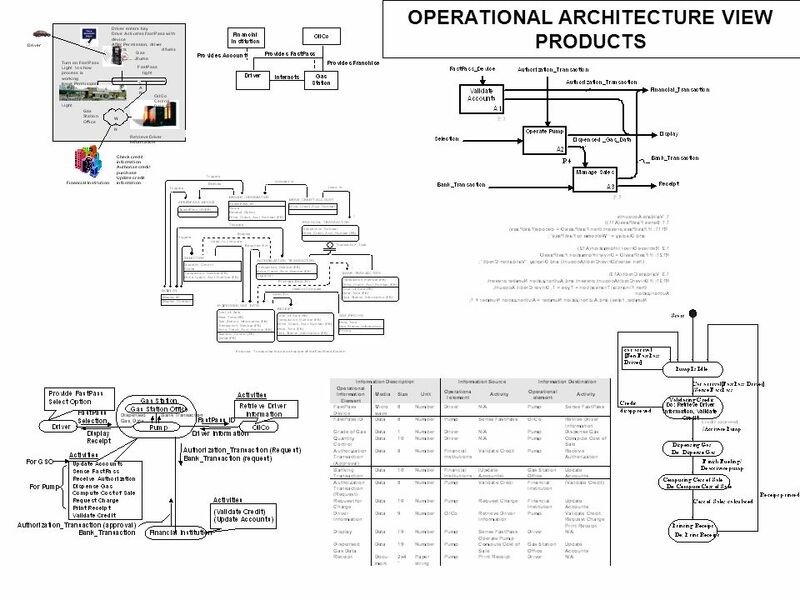 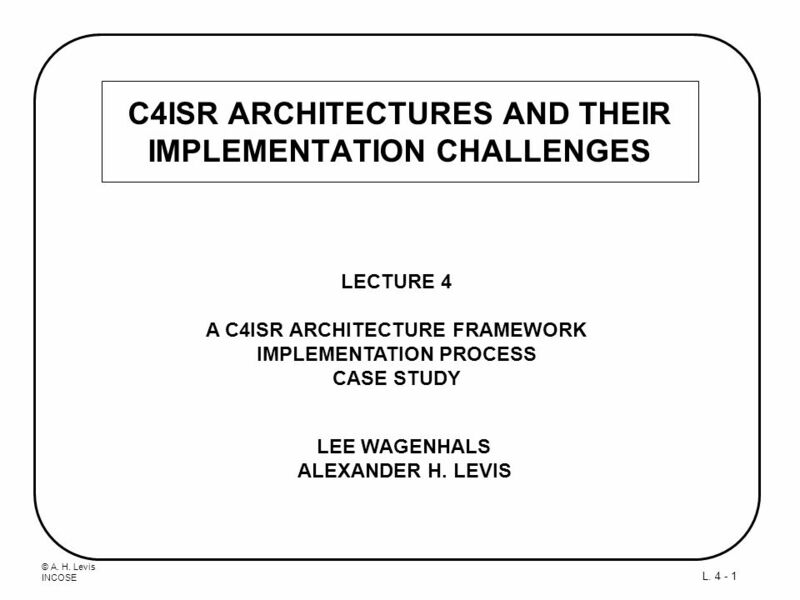 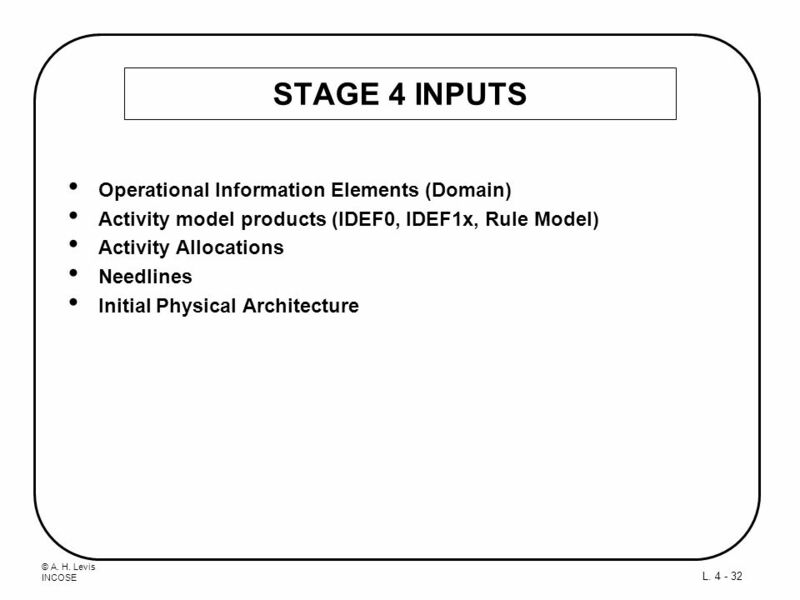 Download ppt "C4ISR ARCHITECTURES AND THEIR IMPLEMENTATION CHALLENGES"